Having decided to turn southward at the confluence of the Steel /Little Steel instead of paddling up and then back down the series of lakes that make up the Little Steel River system, we were left with a few more days of food in our pack and the need of an impromptu mini-trip whose paddle strokes would burn it all up. 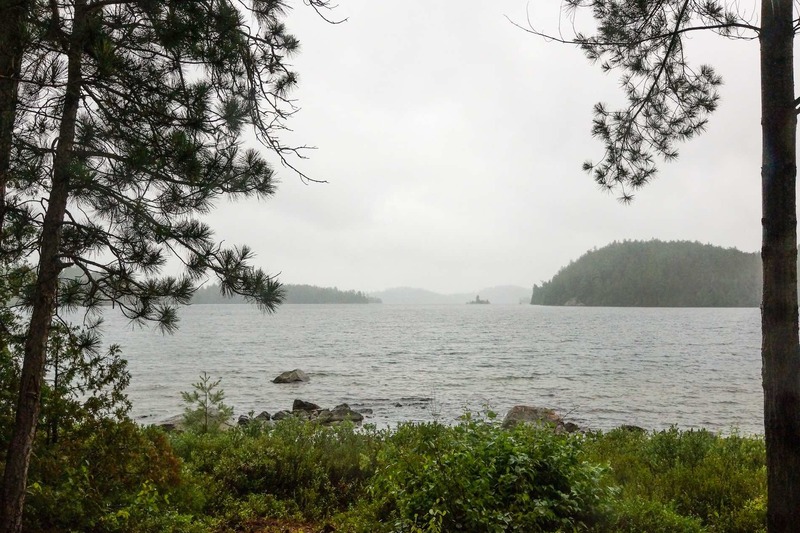 The first was a shortened version of a trip we had done in the Temagami area in the fall of 2014 – (Early Autumn Canoeing In the Heart of Temagami). This time we’d spend a couple of nights at Chee Skon Lake and focus on the hiking trails of the old growth forest. The second was revisiting Maple Mountain, a side visit on our 2009 mountaineering/canoeing combo trip to Ishpatina Ridge. Ishpatina is Ontario’s highest spot at 692 meters; Maple Mountain reaches 641. 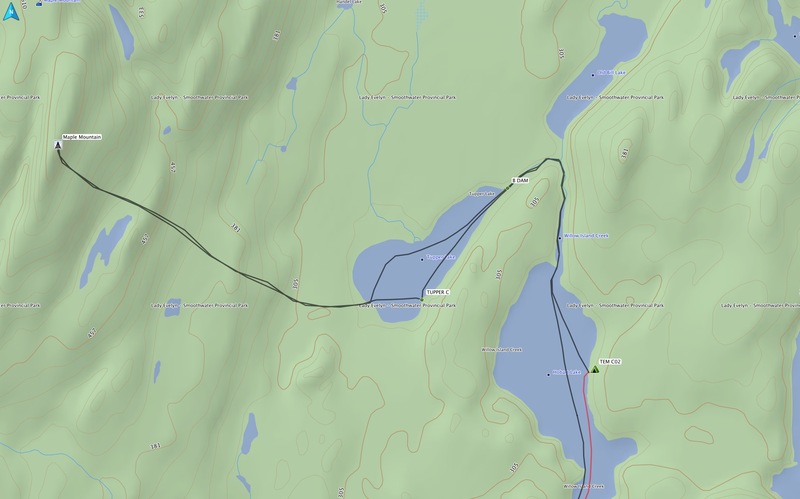 In the end, a paddle to Tupper Lake and the beginning of the trail up Maple Mountain won out. 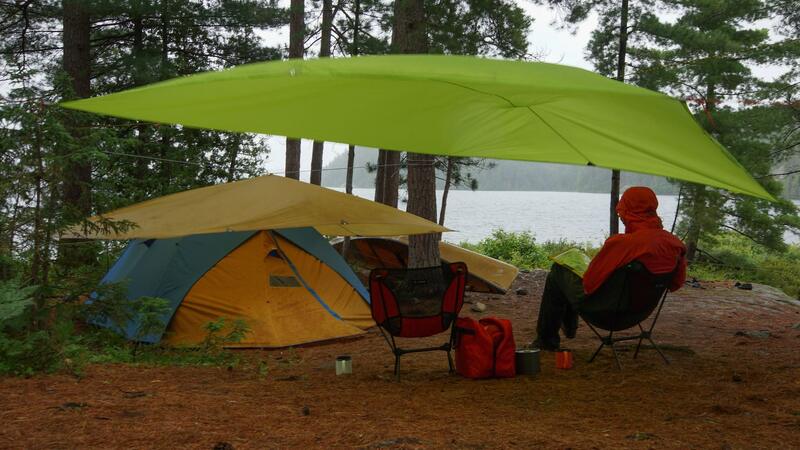 We’d also get to set up our tent at one of our favourite campsites, the one on the east side of Hobart Lake. 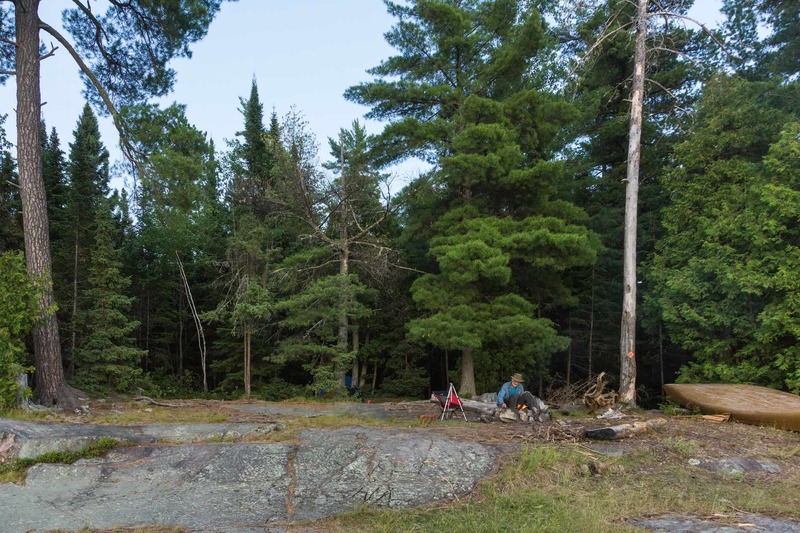 It has all the qualities of a classic Canadian Shield campsite – the sloping rock outcrop that goes up to a flat and sheltered area with room for more than one tent, a great open view west towards Maple Mountain Ridge, and it would also serve as an excellent base camp for the next morning’s paddle over to Tupper Lake and the summit attempt on Maple Mountain! Hobart campsite view in the afternoon – the view does not get old! Neither of us was keen on re-paddling Lake Temagami from the access road across from Temagami Island. A closer access point to Maple Mountain is Mowat Landing. 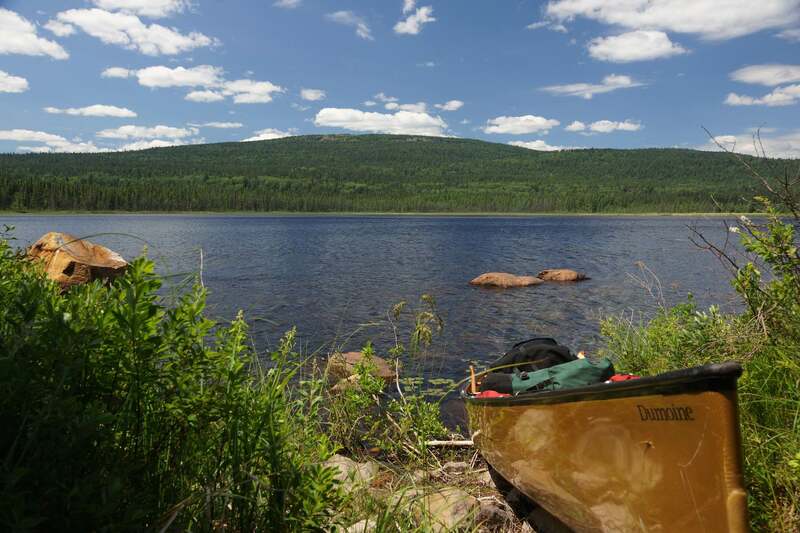 Only one portage – the one around the Mattawapika Dam not far from where the Lady Evelyn River and the Montreal River meet. 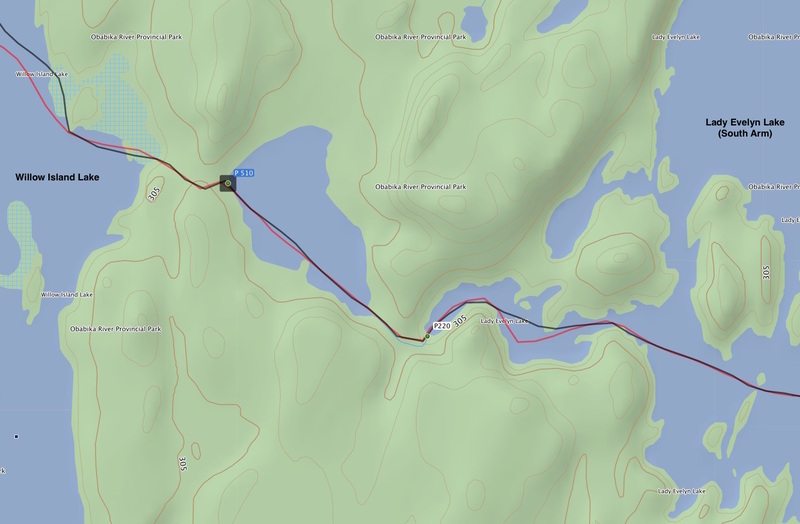 And only one possible drawback – the long stretch of lake paddle to get to the end of Lady Evelyn. 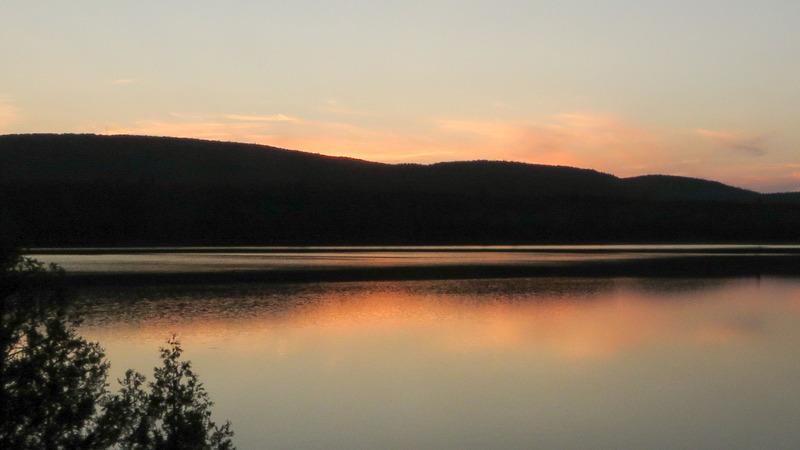 It is about 40 kilometers from Mowat Landing to Tupper Lake and the start of the 3 km. hiking trail to the top of Maple Mountain. There is an alternative access – the Red Squirrel Road to Sandy Inlet on Ferguson Bay. It took us about an hour and half from Temagami to get to the parking area at the end of a rough road that runs from Red Squirrel towards the water. 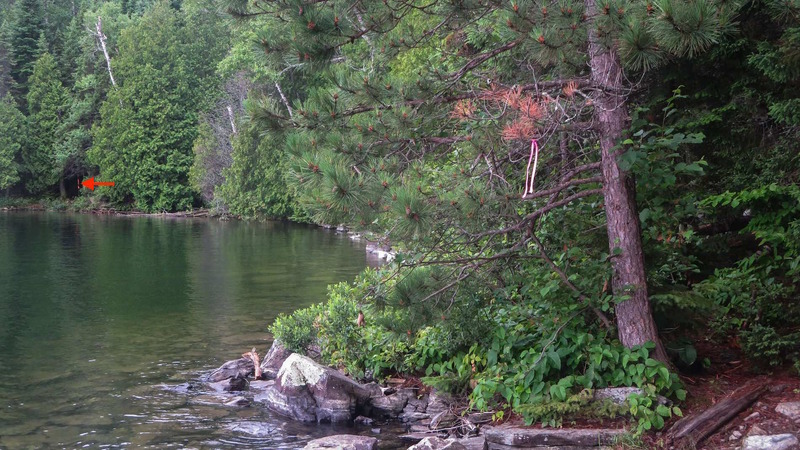 It is a 300-meter portage from the car to the shore. Camp Wanapitei is visible to the south as you walk onto the beach. 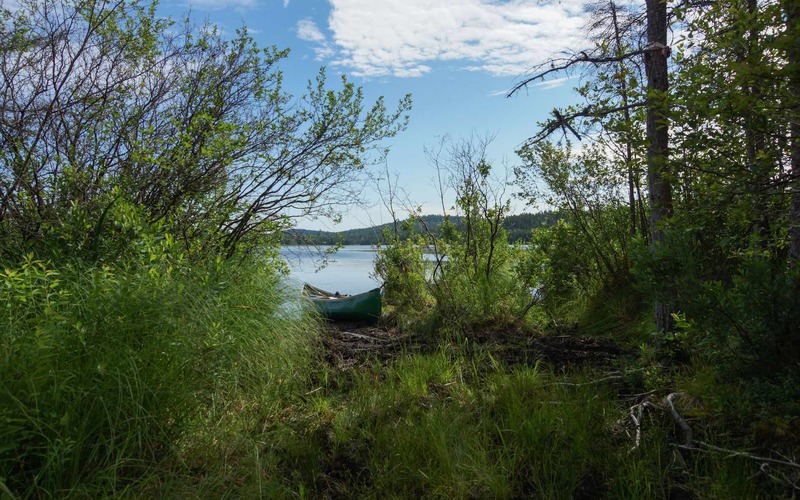 While the Mowat Landing approach is 40 kilometers with one portage, our choice of entry adds three kilometers to the distance and includes five possible portages. We accepted the extra kilometers and carries instead of the potential drama of a bad day or two of wind on Lady Evelyn Lake. Into the water at 1:30 p.m., we paddled across Ferguson Bay with a strong NW wind blowing. That, and the fact we were not 100% clear on the Napoleon Portage’s take-out spot, had us ending up too far south on the west side of the bay. As the map to the left shows, we headed up along the shore to the take-out. We figured we were there when we saw the tree with four bright orange bands on it. We had only been on the Napoleon once – six years ago when we came at it from the west side on Whitefish Bay. The initial steep part was there. 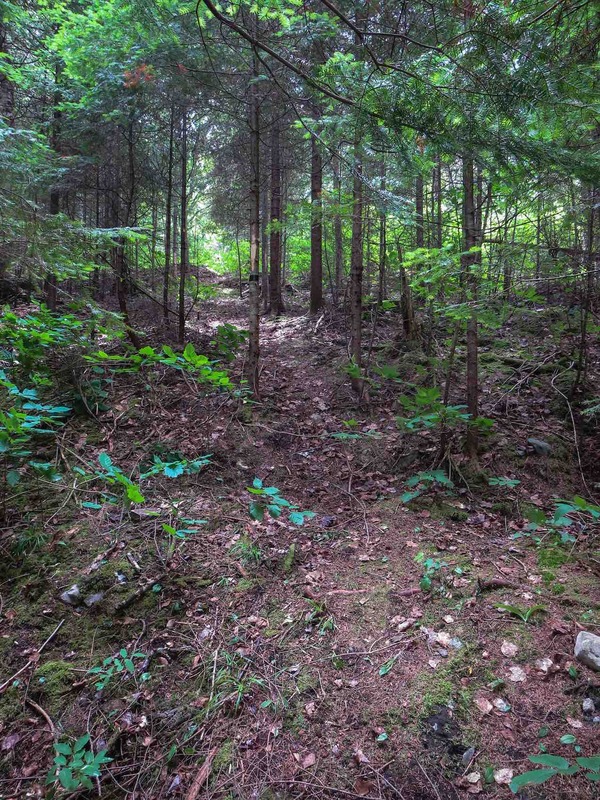 What wasn’t there was a portage trail that has existed for 100 years! We explained it away with reasons like a bad string of blowdowns and ice storms since our last visit. Given the presence of fresh blazes and marking tape we somehow got sucked into the “trail”. And once we were in, the only thought was getting to the end of the thing. Somehow it made sense and didn’t make sense at the same time! 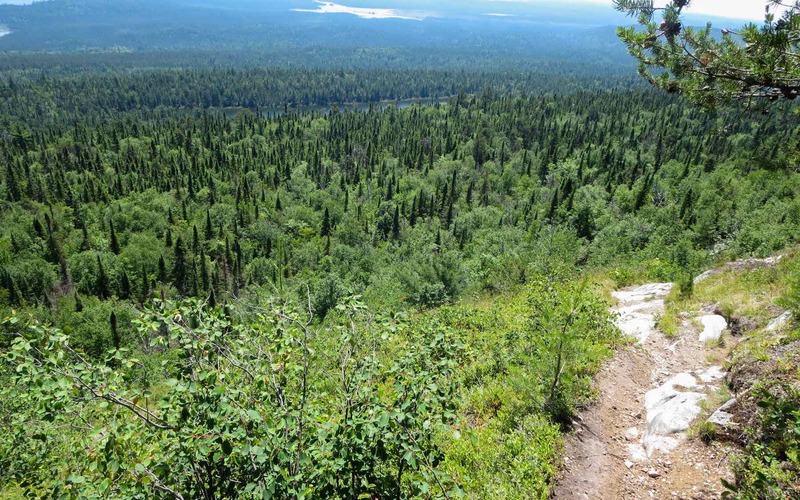 We’d hit a stretch or two that seemed like a portage trail – and then we’d bushwhack through another section that had us shaking our heads in disbelief. N.B. 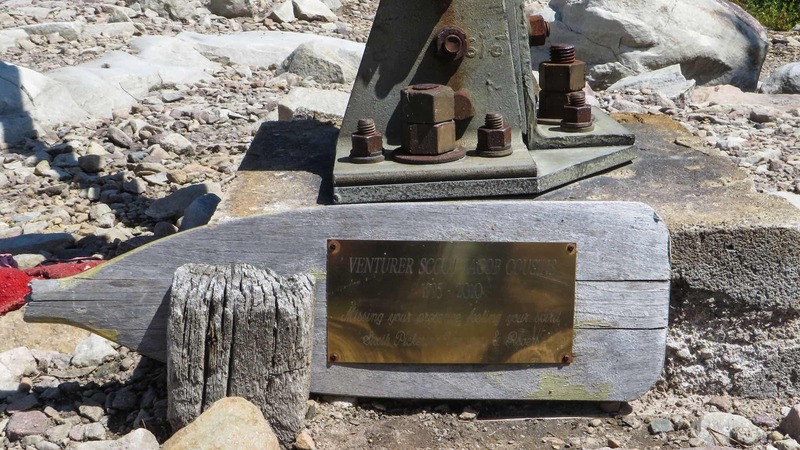 we only found out that it was not the Napoleon Portage four days later coming back. On that day as we approached the take-out landing for the “mystery trail” we spotted what looked like a portage landing about 100 meters north of where we were heading. Going up the shoreline to take a look, I hopped out of the canoe, walked a few meters into the bush from the landing area and came back to announce – “This is the Napoleon Portage!” We are still confused about that “mystery trail’ we followed on Day One – see here for some possible explanations offered by fellow canoe trippers at the Canadian Canoe Routes forum. 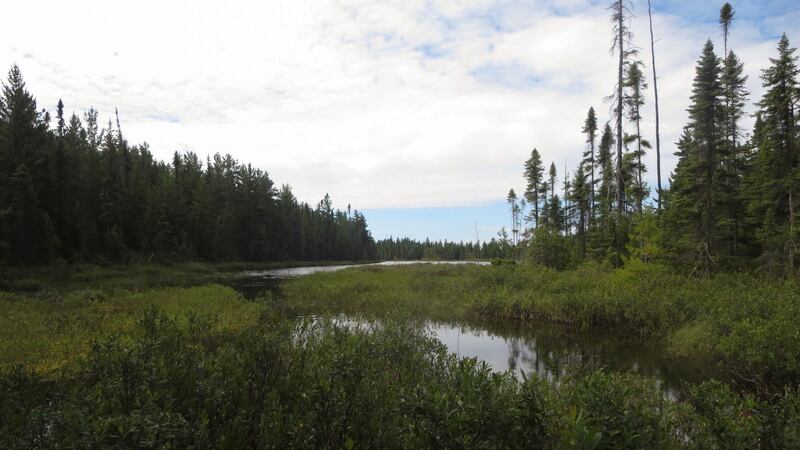 Below is the picture we took four days later when we walked the actual Napoleon Portage to Ferguson Bay from the west. The Napoleon Portage comes out at bottom right. Dangling on the branch is some tape I had just put there. 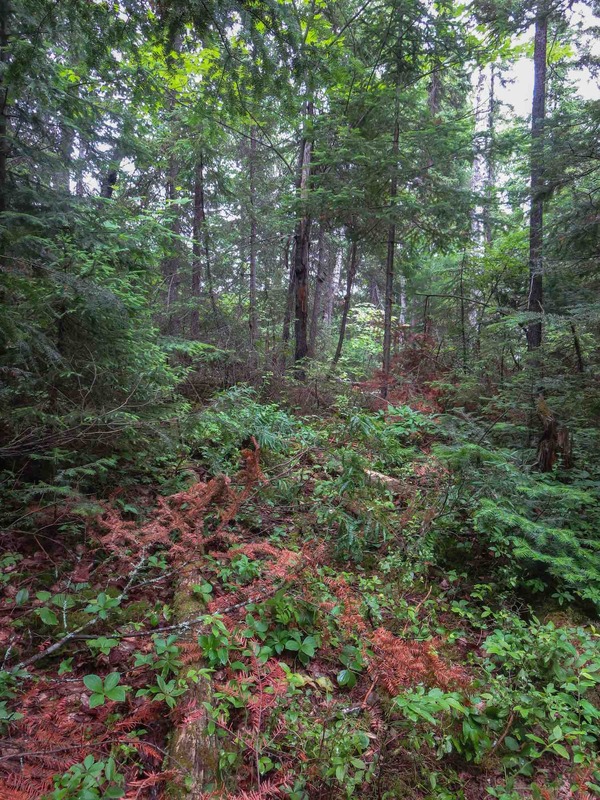 Other than my fresh tape there was nothing at the Napoleon portage other than the very well-used trail itself! The “mystery trail’ begins on the left hand side in the middle of the image. Enlarge the pic and you should see the four bands of orange tape. When we approached it from the south we wrongly figured that we had arrived at the take-out. From the Canadian Canoe Routes poster comment to my thread, we were not the only ones to make that mistake that week! 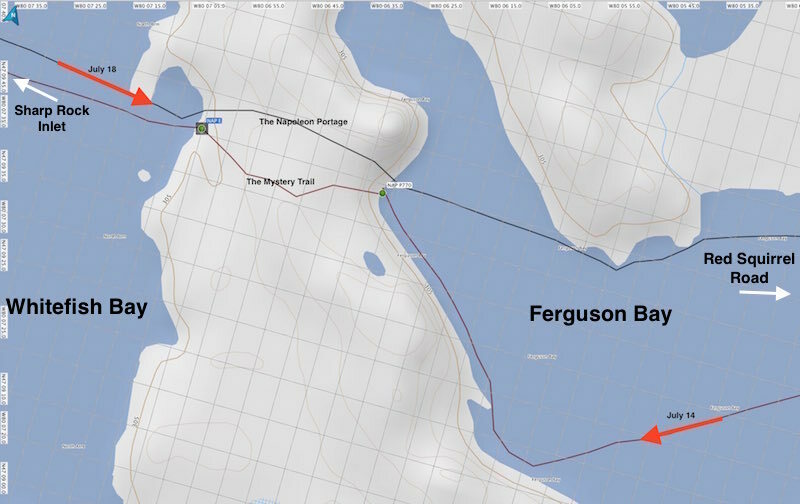 the Mystery Trail and the Napoleon – side by each on Ferguson Bay! To make matters worse, we have added to the confusion by putting up our own marking tape in certain difficult sections as we walked “the mystery trail”. 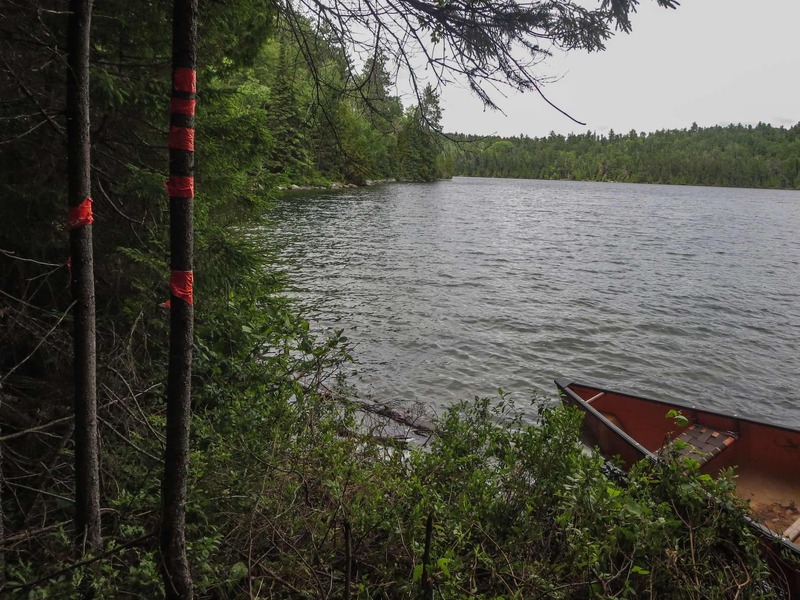 Seeing that tape will unfortunately reassure some poor canoe tripper who makes the same initial mistake we did. 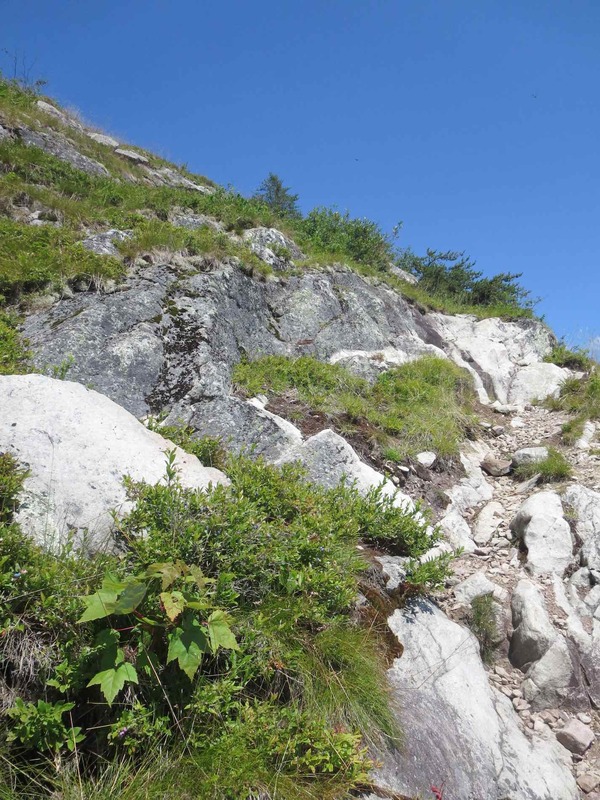 a rough stretch of the mystery trail – the blazes were reassuring! seemingly normal and looking like a trail! The portage done, we got down to paddling and by 5 we were at the far end of the Sharp Rock Inlet Portage. 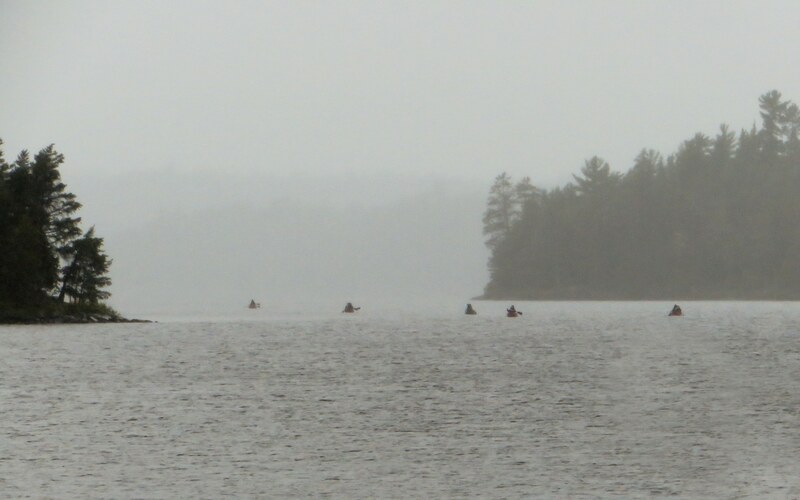 We had already seen twelve canoes in the first three hours of our trip, mostly belonging to the various summer camps located on Lake Temagami. 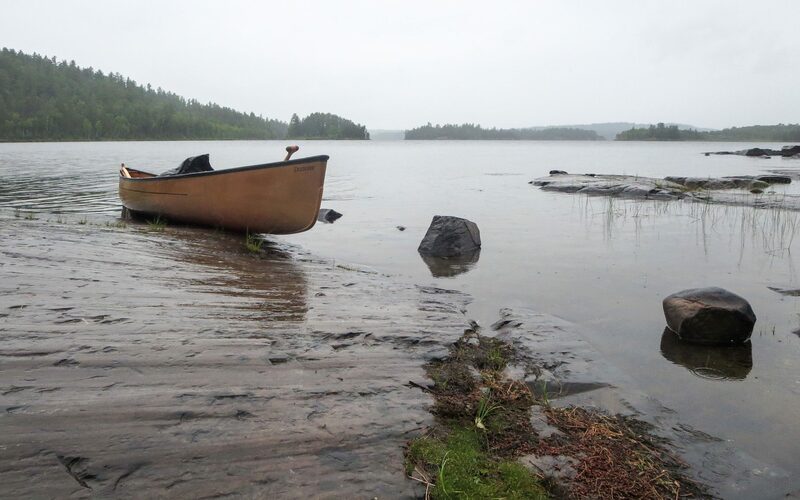 That was twice as many as all the canoes we had seen in five previous summers of Wabakimi and Woodland Caribou tripping! Just after the portage we paddled by the two small islands you see in the map above. 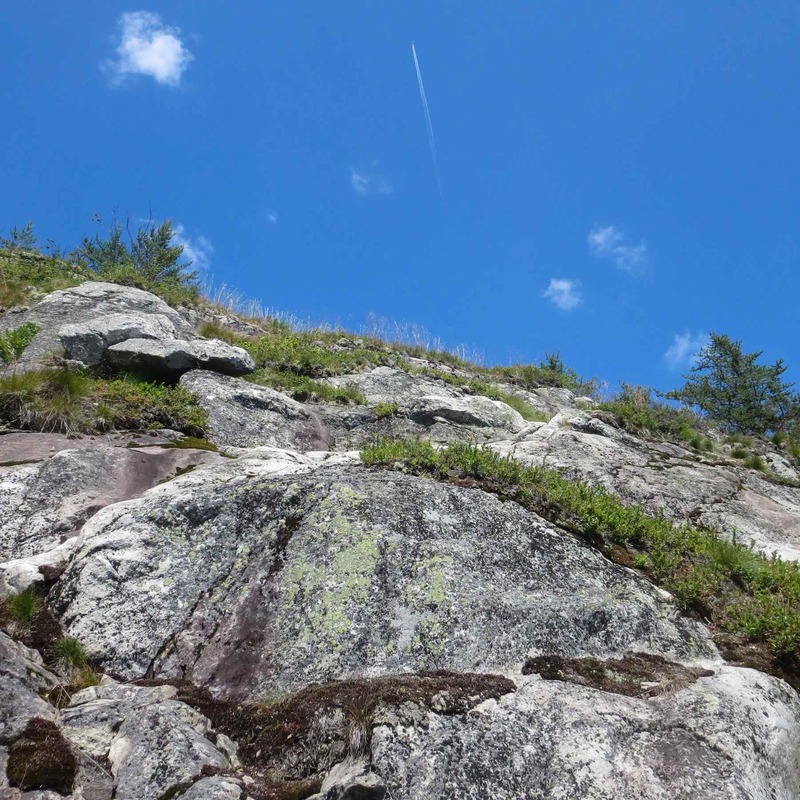 We landed on the west side of the sloped granite outcrop and walked up to the top where we found a fairly flat area to put up our home for the night. We had started the morning at the motel in Iron Bridge and here we were at the east end of Diamond Lake! 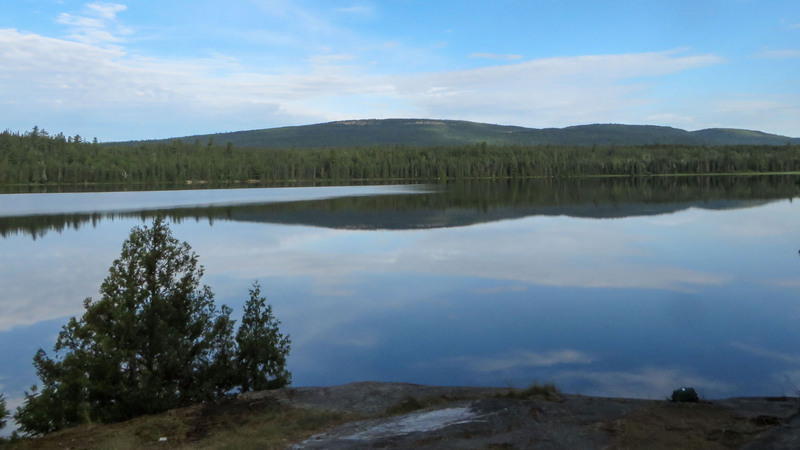 The next target – Hobart Lake and one of our favourite campsites. 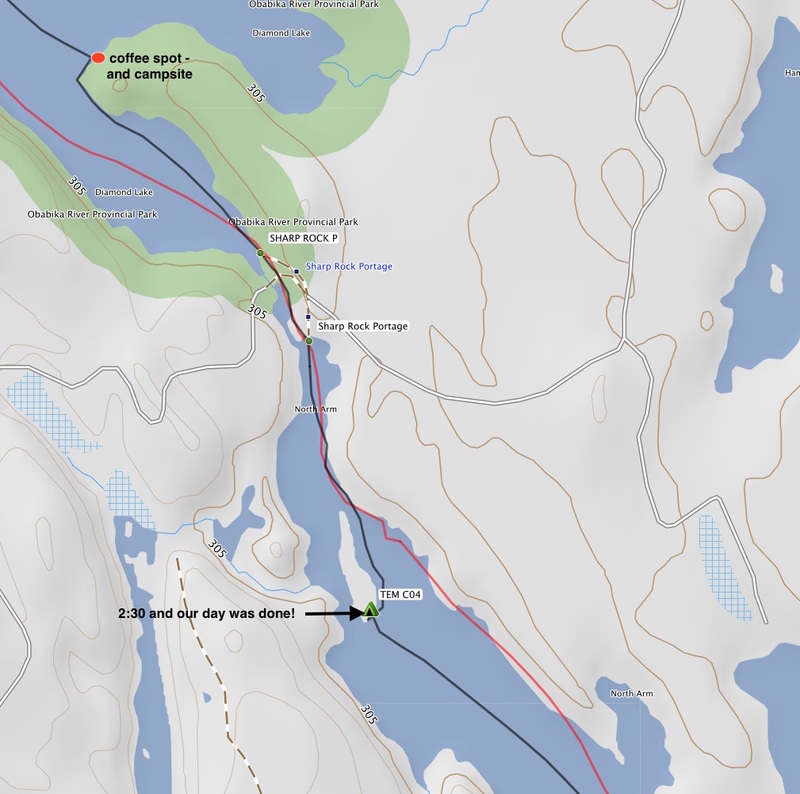 – 40m Diamond L to Lady Evelyn Lake – the main portage is on west side (left as you’re going down); we just ran it and scraped through. It can also be easily lined on the right. 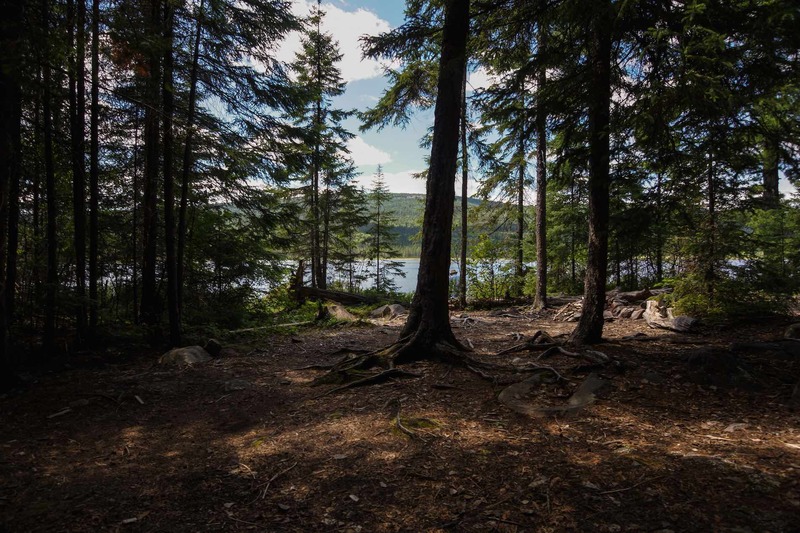 campsite: Hobart Lake – awesome!! multiple 2-or 4-person tents, thunderbox; easy access to water; great swimming opportunity; great view of Maple Mountain all day. N.B. Follow the next three maps from the bottom map up to the top one. We set off shortly after nine and after passing another group of summer camp teen trippers on the way up the north arm of Diamond Lake, we looked over to the pictograph site that we had visited the previous October. (See here for the report.) From the other side of the arm it looked rather small and unimpressive; we decided to leave a visit to our return a few days later. Instead we headed right for the Lady Evelyn Lift-Over. The name “lift-over” has always puzzled us because while we have portaged it on the left, lined it on the right, and run it down the middle, we have never managed a literal lift-over. Seeing it in the image below, it is difficult to picture the Lady Evelyn Falls that was once there. 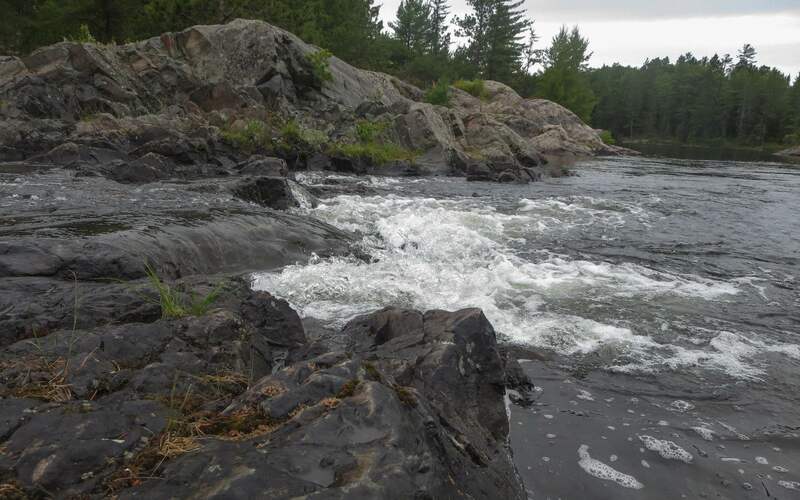 It was the construction of a dam at near the confluence of the Lady Evelyn River and the Montreal River across from Mowat Landing at Mattawapika Falls – a smaller one in 1915 and a higher one in 1925 – that raised the water level of Lady Evelyn Lake by some nine meters. It also caused the falls to all but disappear! It has been reduced to a one-foot drop! The dam was put in by mining companies operating in the area to supply water for power plants on the Montreal River. 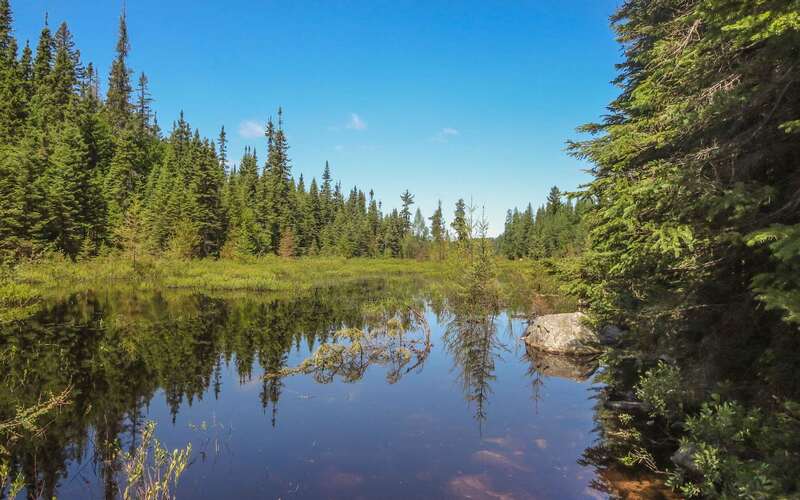 A canoe trip on the Montreal River below Latchford will have you pass over and around all of these ancient dams and compressor plants that used to be there to supply air to the mines of the area. These days the dam holds back water to help operate the string of hydro plants on the Montreal. Many of these plants are peaking plants that operate only intermittently. 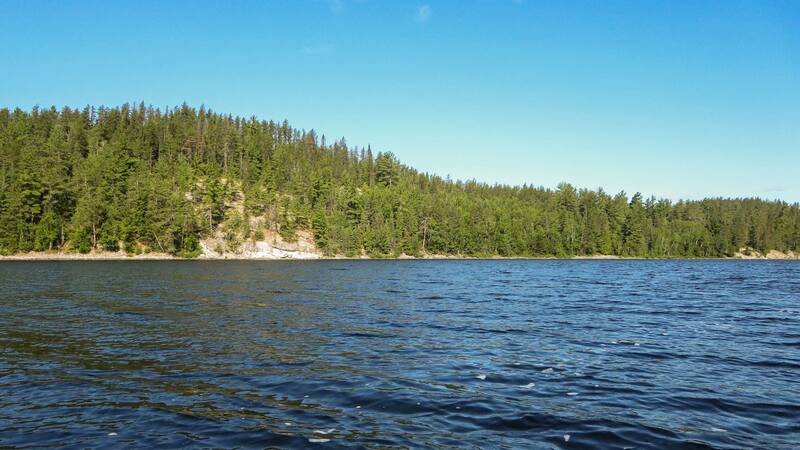 The water on Lady Evelyn Lake gets drawn down over the winter to supply hydro operations. 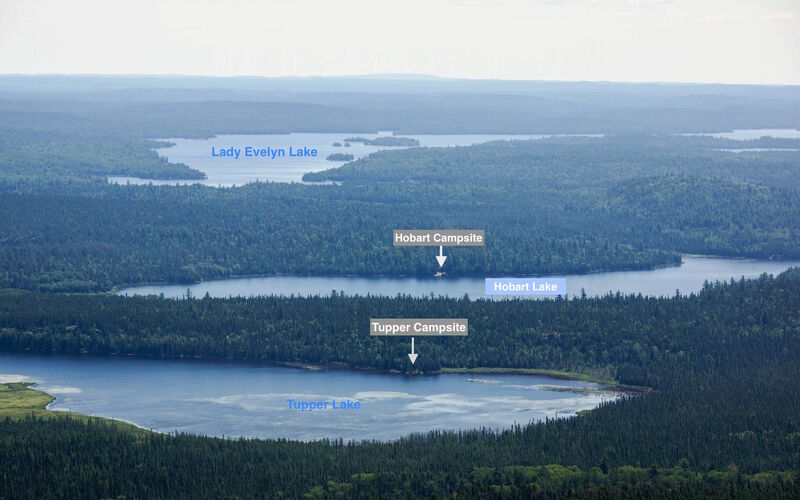 If you go to Lady Evelyn Lake in the early spring, as soon as the ice is gone, the lake level with be about 15 feet lower than in the summer months. 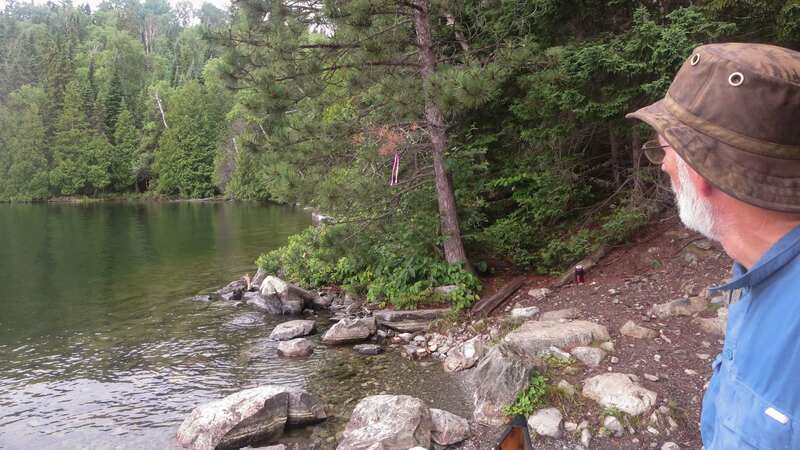 The water level has to be raised by May 15 or so to permit cottagers and others to enjoy the lake. 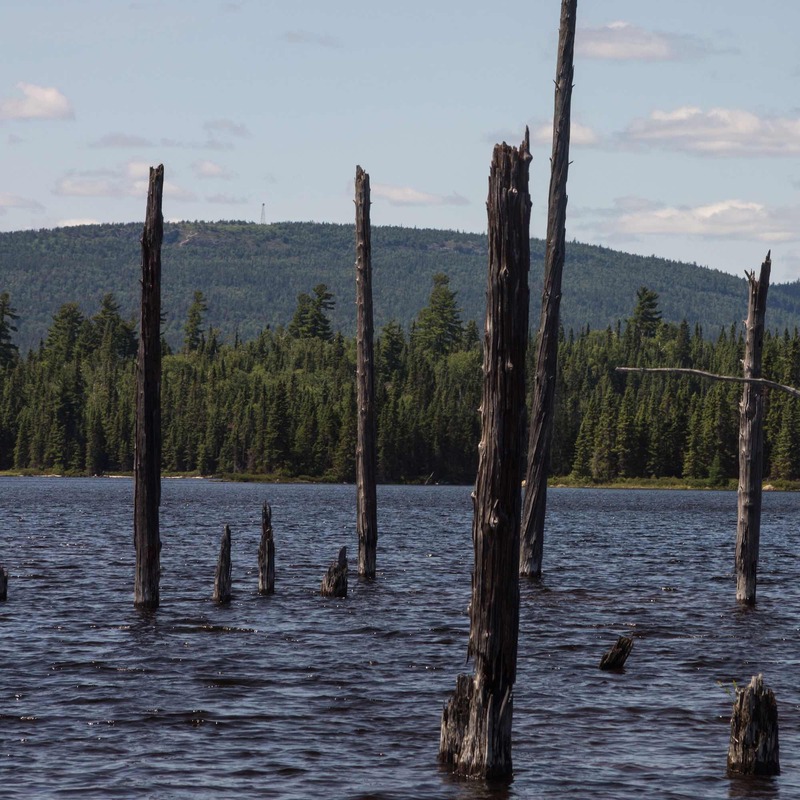 The Diamond Lake into Lady Evelyn Lake spot was not only massively impacted by the Mattawapika dam 30 kilometres to the north-east. There was another dam – a six-foot timber dam – built right across the stream at this point as in the pic above. 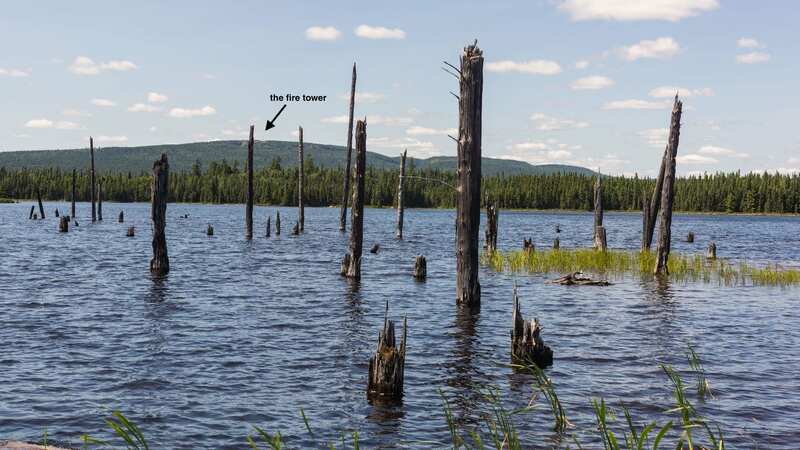 It was constructed in 1942 by a lumber company to float its logs from Diamond Lake down to its mill in Latchford. The dam remained there until 1973 when it was removed by a Ministry of Natural Resources work crew. Apparently the water level on Diamond Lake went down by some 4.5 feet after its removal. Forgotten in all this were the Anishinaabe people who had lived in the area for centuries if not millennia. Among other landmarks, the Diamond Lake pictograph site was partially submerged during the period of the dam’s existence. Check out Brian Back’s Ottertooth article here for a well-researched summary of the two dams and their impact. 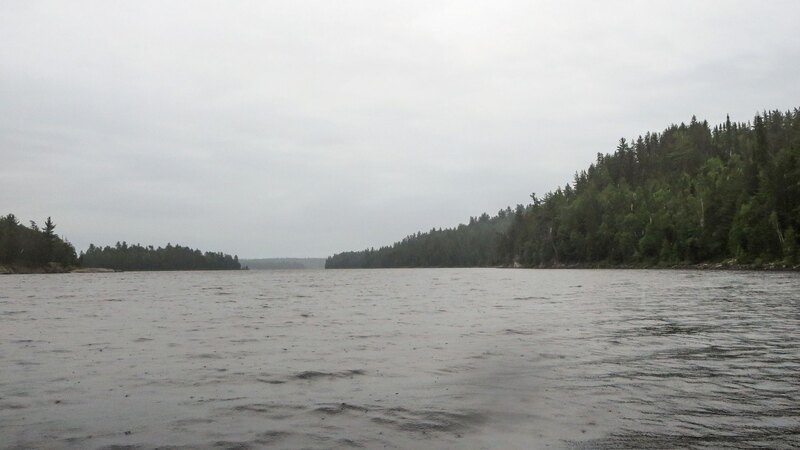 There was some scraping as we slipped through the “rapids” into Lady Evelyn Lake. 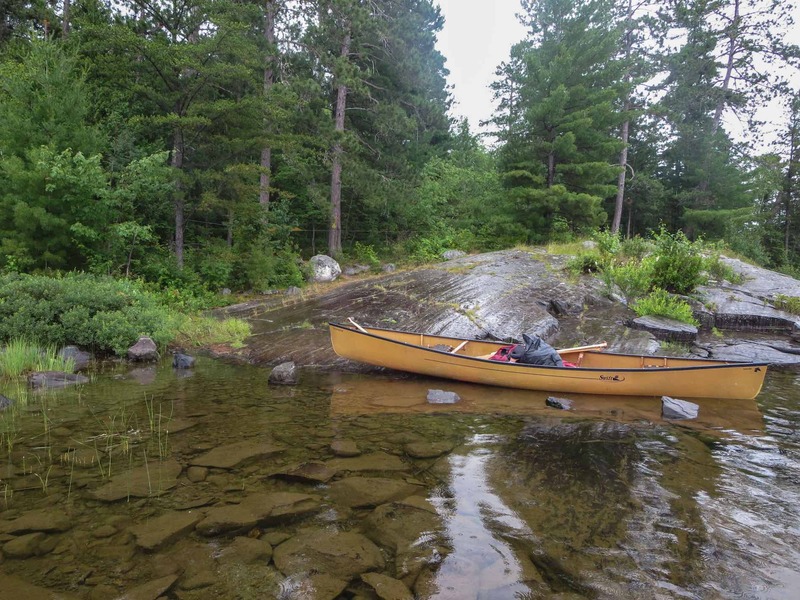 Then it was a short paddle up to the first of the two portages which take you from Lady Evelyn Lake into Willow Island Lake (a part of the Lady Evelyn River system). 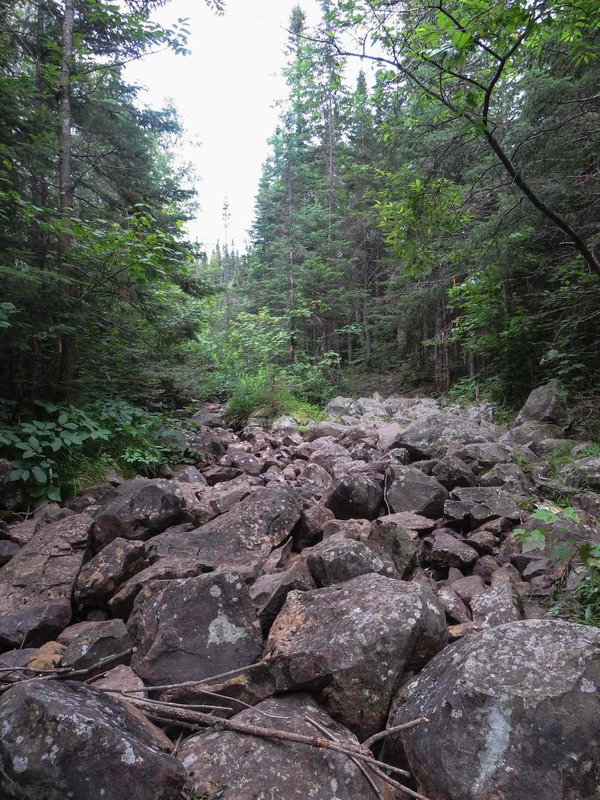 An initial fifteen-meter stretch on a creek bed made up of boulders made for some awkward walking. 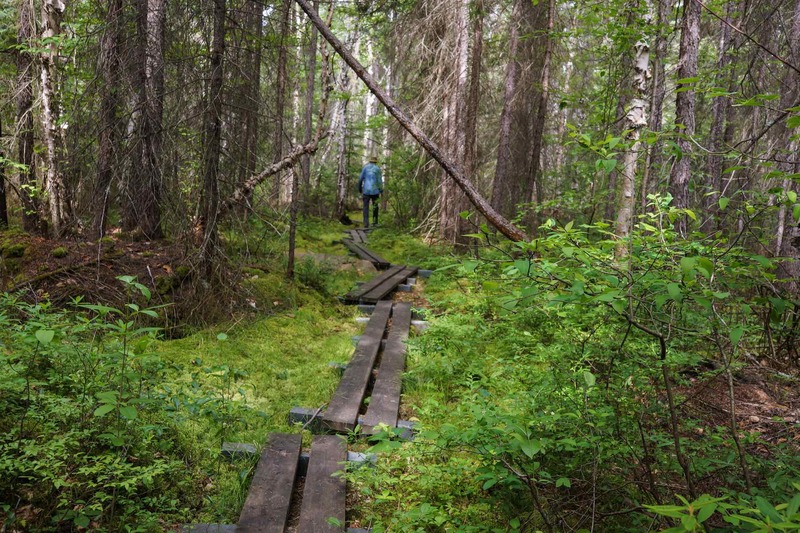 It soon led to a well-trodden trail that came out to the marshy area at the end of the high-water portage. We had to do a double take since the area had changed some over the past decade. 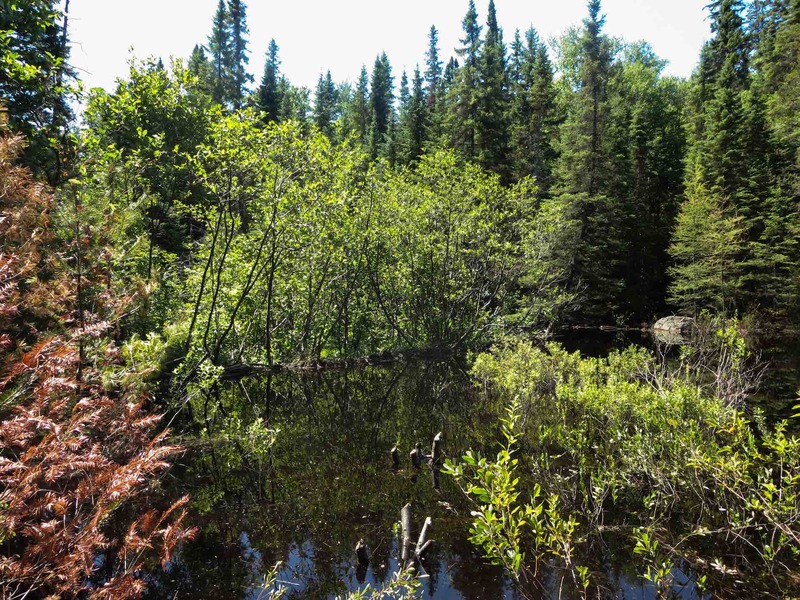 Where we had once pitched our tent on a previous trip was now on the edge of a beaver dam that has created a wetland. The 220-meter carry over, we loaded the canoe and set off down the pic you see below to get to the small lake and the start of the next portage. Running along on the north side is a trail that may be used during lower water periods. We were happy to paddle through. The next portage was easy to find and do. Near the end there is a bit of a diversion to deal with some recent blowdown; the orange tape guides you through the small change to the route. Down Willow Island Lake through the narrows into Sucker Gut Lake and a hard left and we paddled into what you see in the pic below. The first time we came through here we didn’t know anything about the Mattawapika Dam near the mouth of the Lady Evelyn River where it meets the Montreal River. It raised the water level of the entire lake by nine meters – all for the convenience of the mining companies. We had learned since that as a preliminary step fires would often be set in the area to be flooded. The charred trunks of the pines and spruces stand as silent witness to those times. 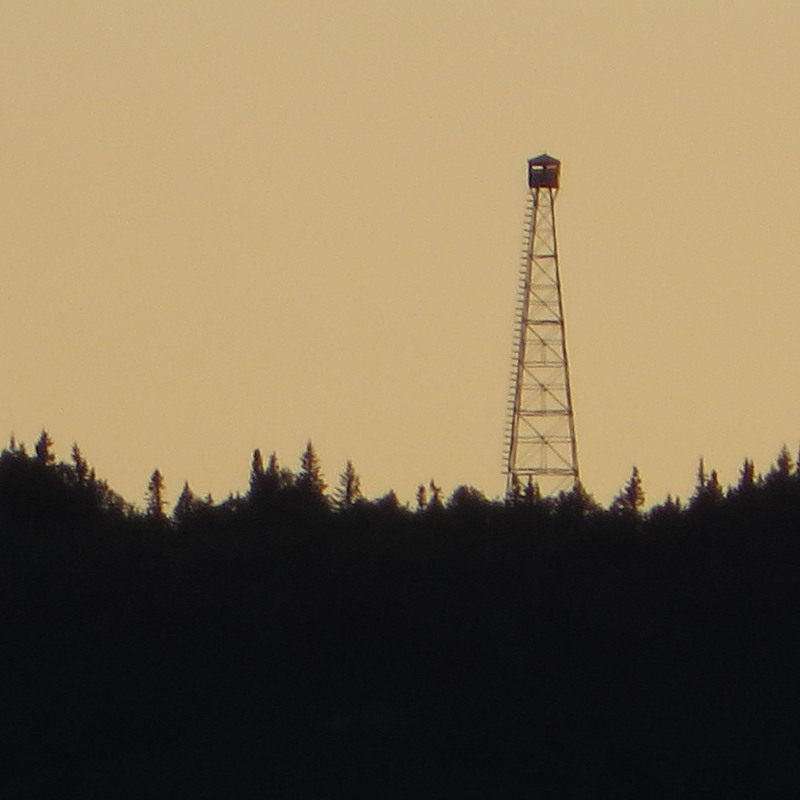 As we paddled westward we also saw the Maple Mountain ridge and the faint presence of the fire tower again. We had been here in 2009 and hadn’t forgotten. When we saw a canoe on Hobart Lake I figured that the premier campsite we were hoping to get was already occupied. We were busy formulating a Plan B as we paddled up to the site, one of our favourites, and found – well, nobody was there! time: Maple Mtn 09:30 a.m.-1:30 p.m.; Tupper L to campsite 1:30 p.m.-5:15 p.m. Unlike the overcast day we had six years previously, this one would be clear and sunny. After our usual oatmeal breakfast, we savoured both the mugs of coffee and the morning view of Maple Mountain. And then it was off – first paddling the 3.5 kilometers to the start of the Maple Mountain trail. 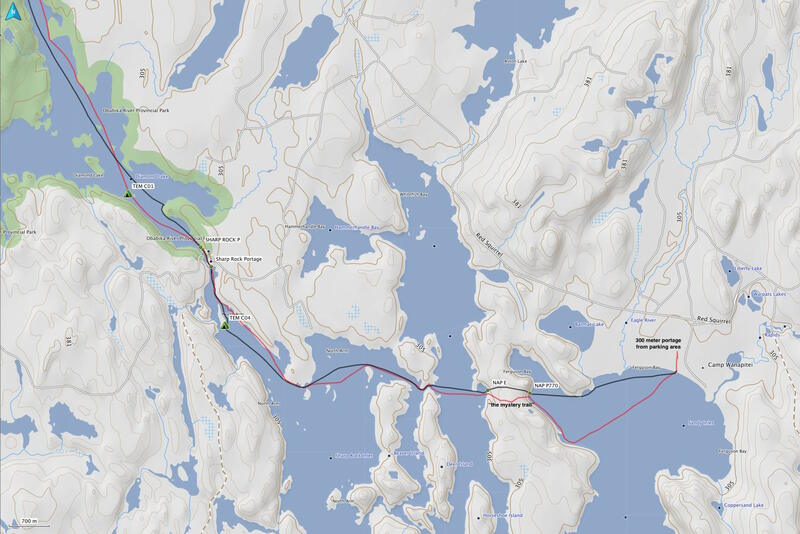 The map below shows the route – about 1.7 km to the “confluence” of Tupper Creek and Willow Island Creek and then up to the beaver dam and Tupper Lake itself. 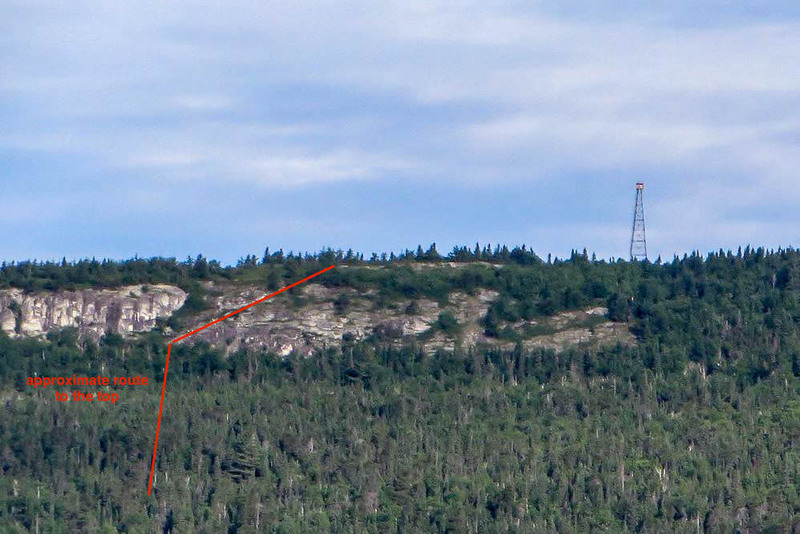 Maple Mountain at 642 meters is not, contrary to what some may think, the highest point in Ontario. It actually ranks 13th. according to this well-researched list of the province’s high spots. (See here for the Ottertooth article.) Mind you, there is only a 51-meter gap between it and Ishpatina Ridge, the #1 point at 693 meters. Ishpatina is located just twenty-seven kilometers to the west. It was Robert Bell of the Geological Survey of Canada who gave it the name “Maple Mountain” back in 1888 . 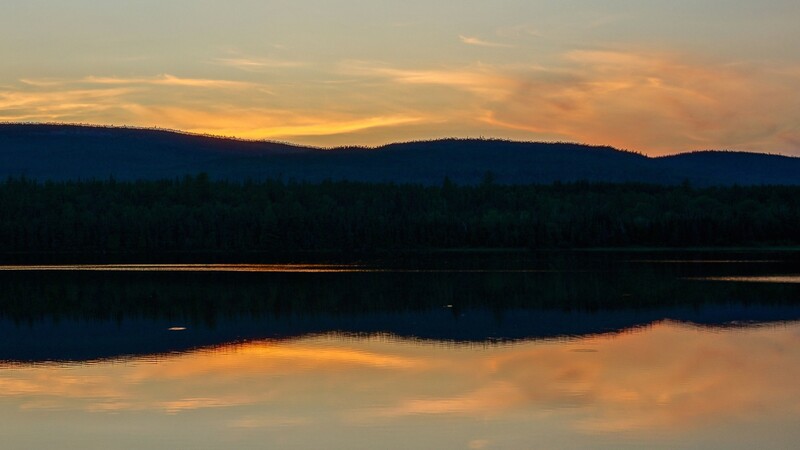 However, the ridge with its dramatic rise in elevation had long been on the mythological map of the local Anishinaabek (i.e.Ojibwe), known to them as Chi- bay-jing, “The Place Where Spirits Go”. Where Maple Mountain does rank #1 in Ontario is in terms of vertical rise. 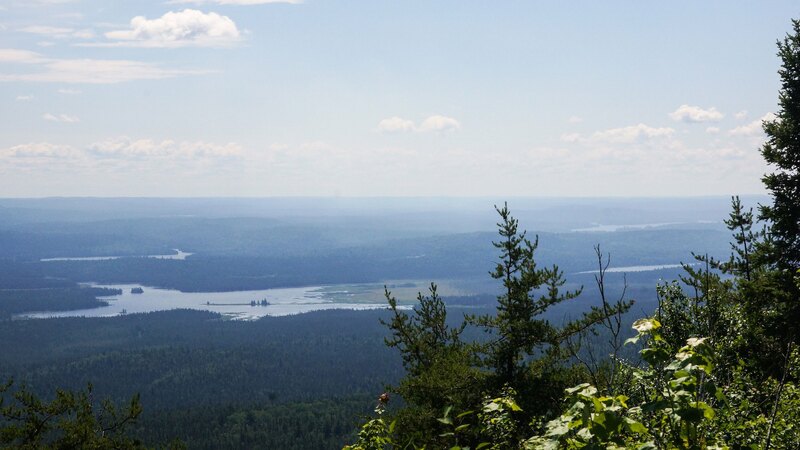 It is 351 meters higher than Tupper Lake down below, while Ishpatina, for example, is 317 meters above Scarecrow Lake. For more solid information on Maple Mountain, Brian Back’s in-depth look here is your best bet. 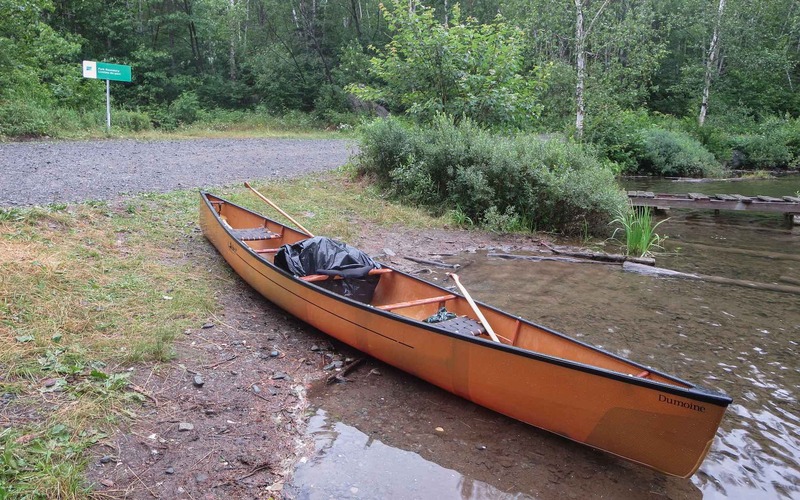 As we approached the landing and the start of the trail, we spotted a canoe sitting there. We were obviously not the day’s first. Given that we had not seen anyone paddle by that morning, chances were good that they had camped on Tupper the previous night. 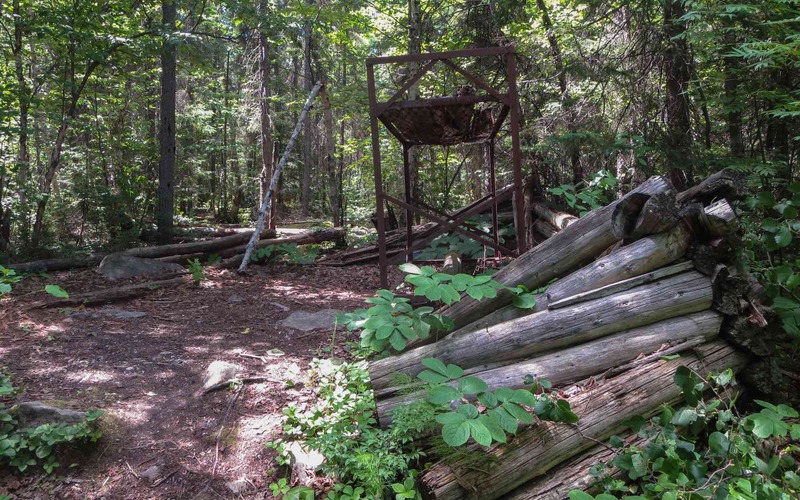 At the start of the trail are the ruins of the fire ranger’s cabin. Nearby is a spring where we filled up our water bottle. And then it was on to the trail. The trail for the first five hundred meters is quite flat and has a long stretch of 10′ boards taking you over some mushy bits. I counted 35 of them as we walked along; after a bit of a gap we came to seven more. It made for easy walking. Some altitude needs to be gained though and it comes soon enough, a gradual ascent – and occasional giving away of all the “up” you just gained as the trail heads downward for a bit! The trail also gets somewhat less groomed. We counted at least a couple dozen places where a chainsaw would help to reestablish the trail. As it is, deadfall across the trail has hikers walking around the obstructions. 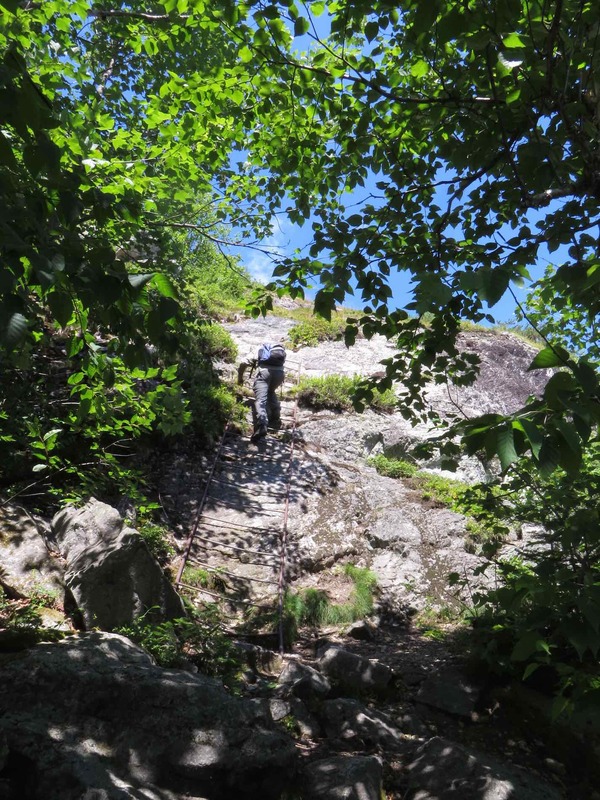 We spent the first half hour stopping often to clear smaller trees and branches from the path but we realized that it would take forever to get to the top if we were also going to be doing trail work as we walked up. It was somewhere near the lake that we met the two women and their dog, an older Labrador who was having trouble with the blockages on the path. They had decided to turn back without getting to the top. Given what was coming up, there would have been more stretches that the Lab would not be able to handle. 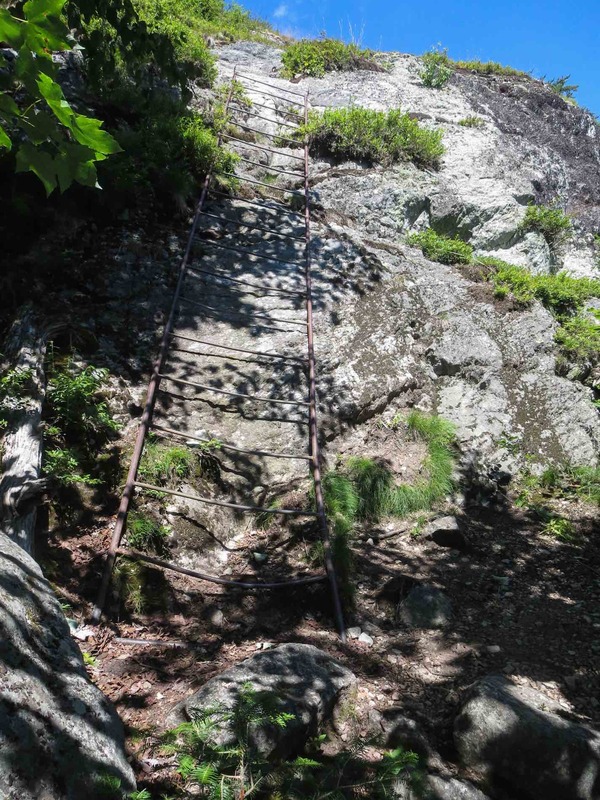 This six-meter steel ladder take you up an almost vertical section of the trail and leads to more scrambling before the summit. In true mountaineering fashion, there are a couple of points where you think you are there, only to realize that wishful thinking alone does not make a summit! The ladder is secure and safe to use and we scampered up and down without a worry. 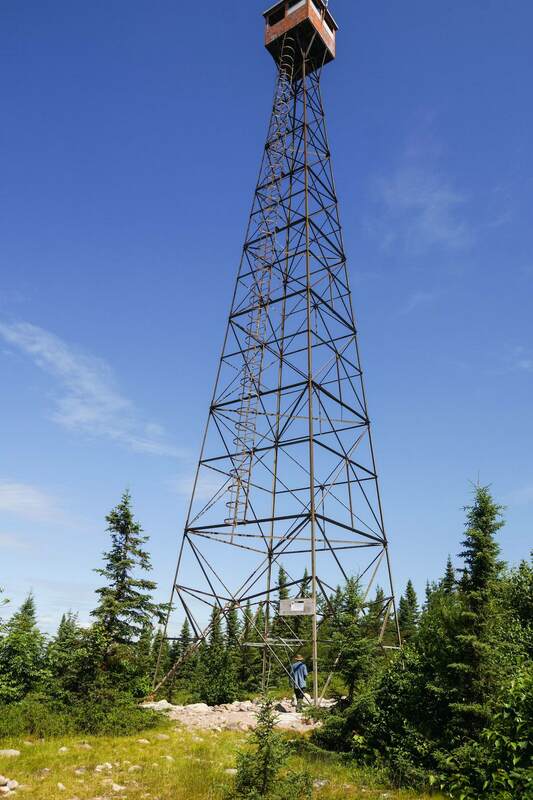 Seeing the 30-meter high Fire Tower is the sign that you are almost there! On our 2009 visit it was overcast and the bugs were so bad I climbed half way up to the cupola to escape while I snapped some photos. We would have no such problems this morning – no clouds, no bugs. There was another change since our last visit. The first seven meters of the ladder have been removed, making access to the rest somewhat awkward. I am sure some will still be up to the challenge! There is one complication – even if you do get up to the ladder and join the elite crew who have climbed up over the decades, you will end up at the bottom of the cupola with no way to get in. It has been locked! 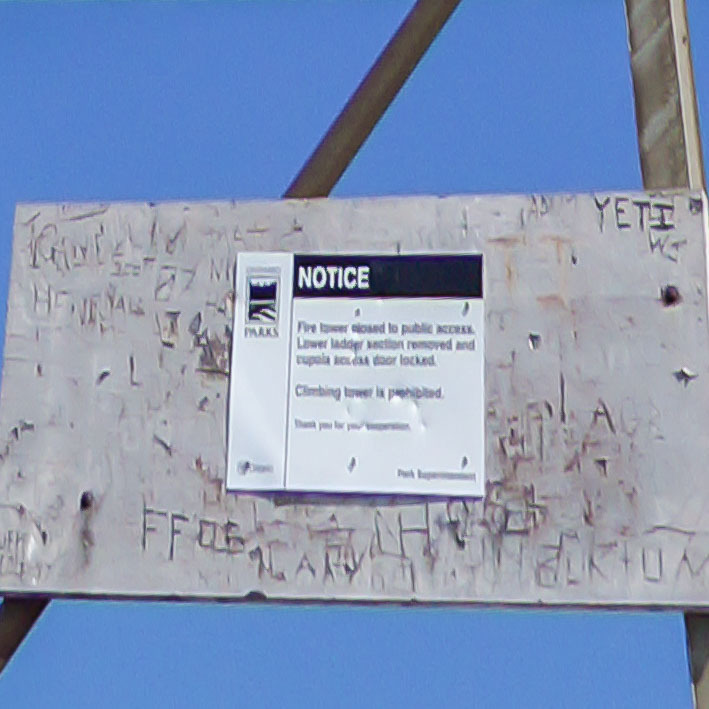 The sign at the foot of the tower explains all this to discourage you from even bothering to make the climb. Update: More recent visitors have noted that the lock on the cupola floor door has been removed! Getting up to the top is obviously (for some people) an essential part of the Maple Mountain experience! 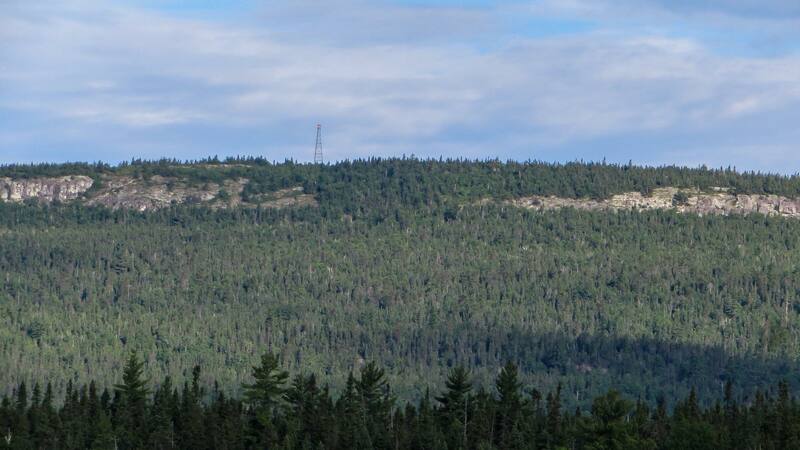 With the exception of Caribou Mountain*, a municipally-operated tourist site, above the town of Temagami, the rest of Ontario’s towers are on the chopping block. 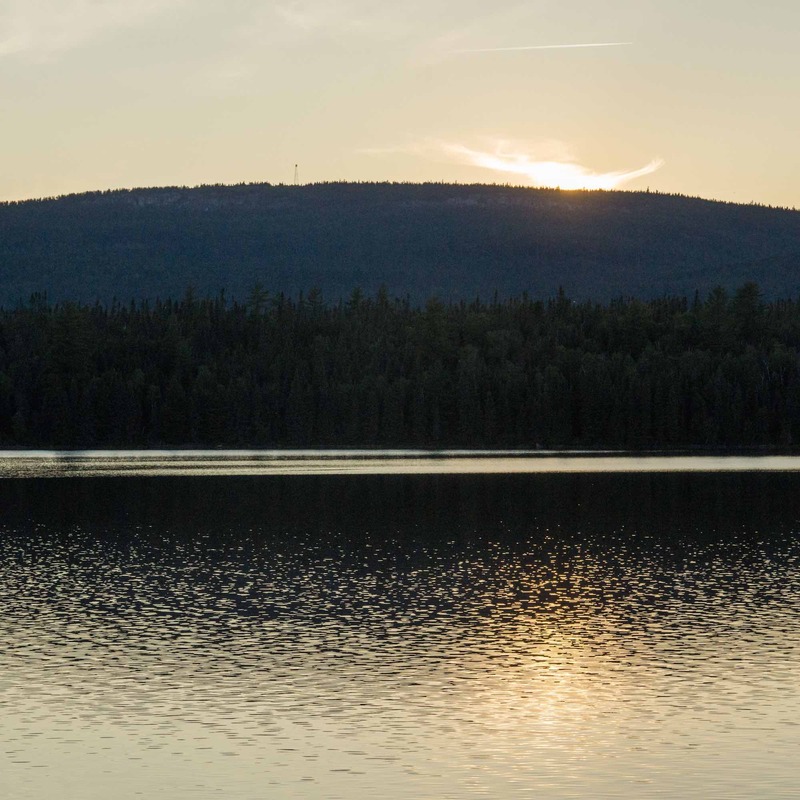 That includes two in Lady Evelyn-Smoothwater Wilderness Park: Ishpatina and Maple Mountain, both popular backcountry destinations. See here for the full article. 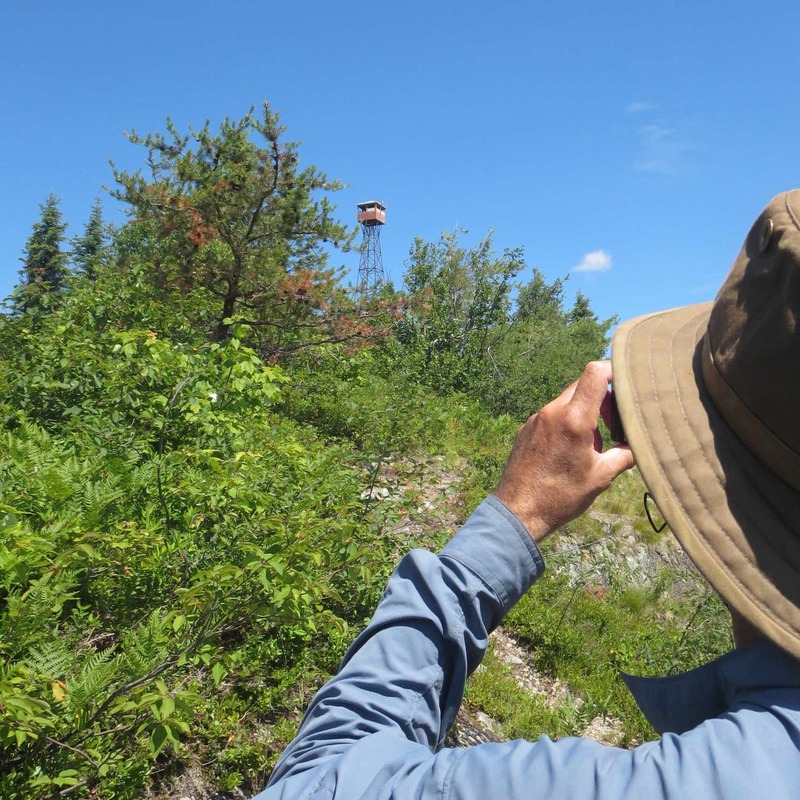 If seeing that fire tower is a major reason for your visit to Maple Mountain, better get there sooner than later! 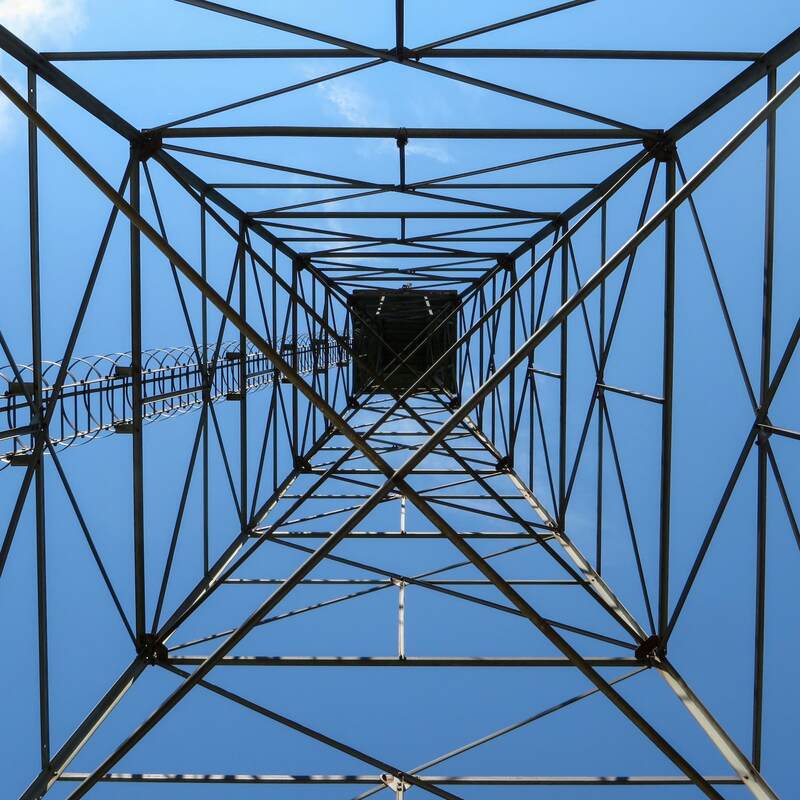 As iconic as the fire tower may be, there is something else much more majestic up on top of Maple Mountain. 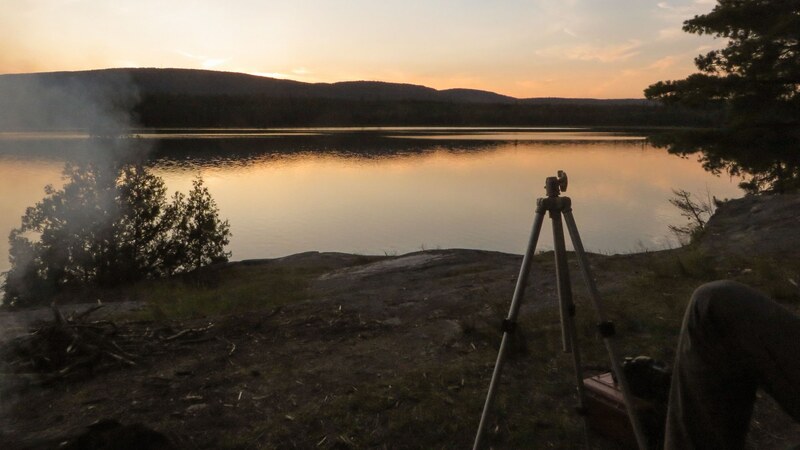 The images below – minus the feel of the wind and the sun as you sit there and take it all in – give you an idea of what you’ll see after spending one and half hours on your canoe trippers’ pilgrimage. It is a “wow” moment for sure. In the end, the experience of walking up to the top and taking in the view trumps all the statistics and the tower. As we approached the top we watched two eagles in the skies above the mountaintop. Eagles are often associated in the Anishinaabe world with the manitou Animiki, the Thunderbird, next to Gitchi Manitou the most powerful of spirits. They were swooping back and forth, riding the winds and surveying their domain and we were under their watchful gaze! You just know you’re in the right place when you see eagles. We spent forty-five minutes taking in the views, chillin’ and refueling for the walk back to the canoe. If it takes 1 1/2 hours to get to the top, it takes maybe an hour to get back to the canoe. Instead of an extended bit of aerobic exercise, now your knees and leg muscles get to be stressed. A pair of trekking poles – not part of a typical paddler’s kit – would help. Before we paddled back to Hobart Lake we dropped in at the campsite on Tupper’s east side. 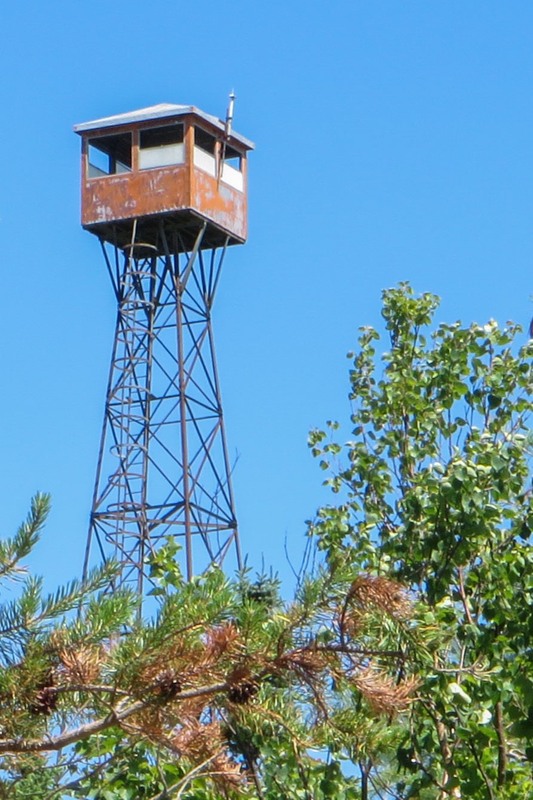 It has a beautiful view of the mountain and the fire tower. While the site is not in the same league as the one on Hobart it would serve as a good alternative if the other one was already taken. We had lunch there and then set off to retrace the route that got us there. That afternoon we paddled as far as the narrows between Sucker Gut Lake and Willow Island Lake. After having wind from the north-west for the two previous days, now that we had started paddling south the wind had changed too; it was coming from the south-west. The campsite we found there was average at best but did the job. The tent was nicely tucked away in the woods and there was an open area where we set up our cook gear. The canoe on its side provided a nice wind screen and we soon had the two butane stoves going. Given that it was past 5 p.m. other paddlers had also probably stopped for the day since we didn’t see anyone come through the narrows after we set up camp. time: 07:40 a.m. to 2:40 p.m.
After an early breakfast we were on the water before 8; we were hoping to get some calm water before the south wind kicked in again. 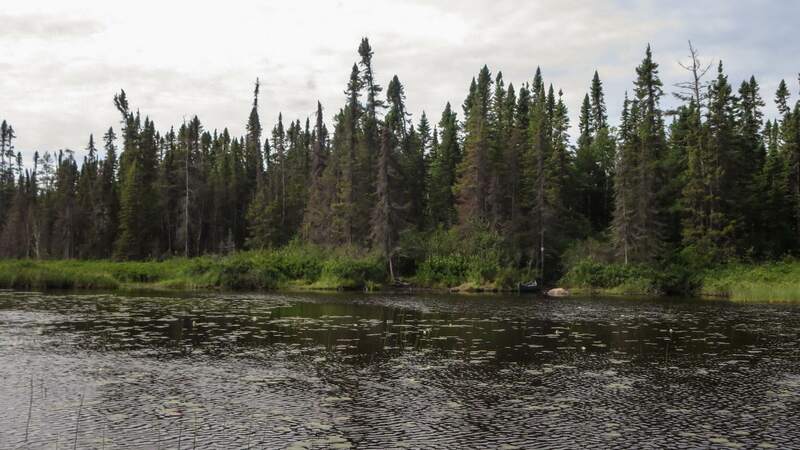 By eleven we were past the two portages and into Lady Evelyn Lake. That is when it started raining – spitting at first and then getting more serious as we moved into the afternoon. We would stop for a cup of coffee under the tarp before moving on to the Lift-Over. As we entered Diamond Lake, I looked down the shore and spotted the pictograph site on the west shore. As humble as it had looked from across the water as we paddled by on our way up, now it looked even less imposing. We did paddle by just to be sure that it was the site. You can see it in the image above – the sandy brown bit about two-thirds of the way along the water line running across the middle of the picture. 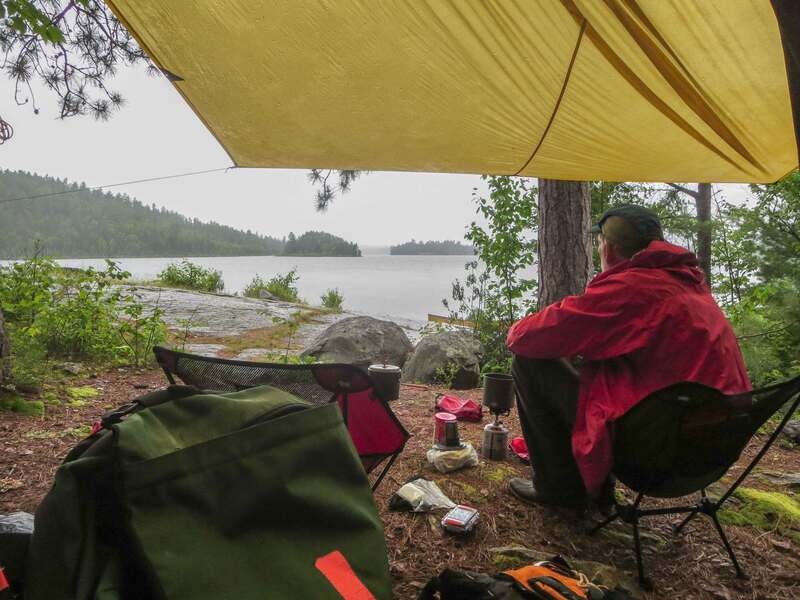 As we approached the Sharp Rock Portage, the rain came down heavier and we pulled in at a designated campsite and put up the tarp. We figured we would sit out the worst of it and then get moving again. In the meanwhile we fired up the stove and got the lunch and coffee fixings out. 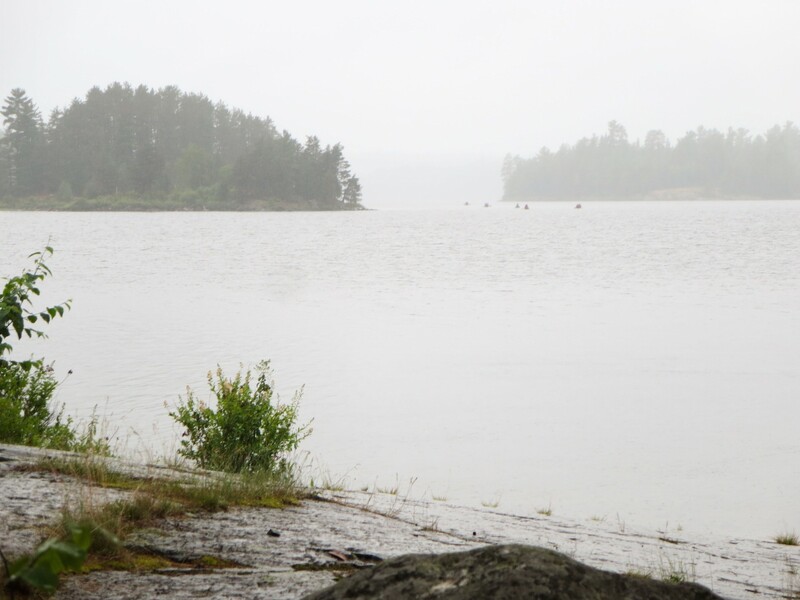 While we sat there we noticed five specks on the misty horizon – a Temagami camp group was approaching! We would lose sight of them after a while as it seemed that they had paddled up a bay to the north. However, as we were taking down the tarp and getting ready to move on, there they were again. They were looking for a campsite and wanted to know if “ours” was available. The thing that most impressed us was the toughness and resilience shown by these canoe trippers in their mid-teens. It was still raining and they were carrying on with their business. We wished the girls good luck with the weather and pushed off, wondering how far we would get. It was a good thing that we had started the day as early as we did. We didn’t get too far! After the Sharp Rock Portage we paddled for a bit but the combination of rain and wind and choppy water convinced at least me that we should just call it a day. Talk about toughness and resilience! Max wanted to keep on going in order to make the next day – the one back to the car – that much shorter. With the classic argument of – why kill ourselves now when tomorrow morning it will take half the energy to cover the same distance? – we pulled in at the south end of the island seen on the map below. It was 2:35 and we had covered maybe 3.5 km. since our mugs of coffee. 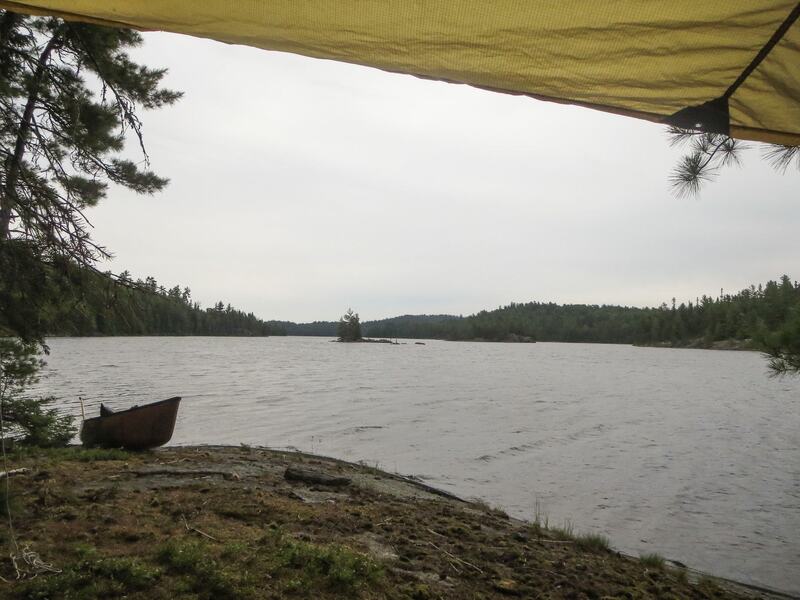 Tent and tarps went up and the canoe was set up as a windscreen and we hoped for better weather the next morning. 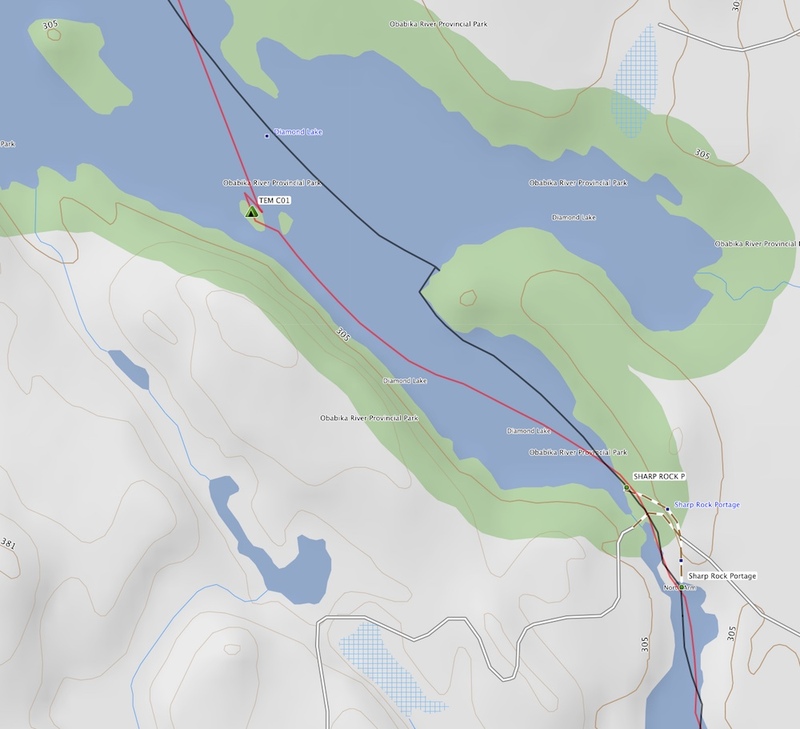 The previous evening’s major deliberation had centered around which portage to take into Ferguson Bay. About an hour’s paddle down from what we still thought was the Napoleon Portage there is another shorter 400 meter one that goes into Pickerel Bay. (See the map below for the location.) We’d then have to paddle an hour north to get back to the top of the bay. Plus we had no idea about the shape that this shorter portage was in. For all we knew it could be in the same shape as the trail we had done. 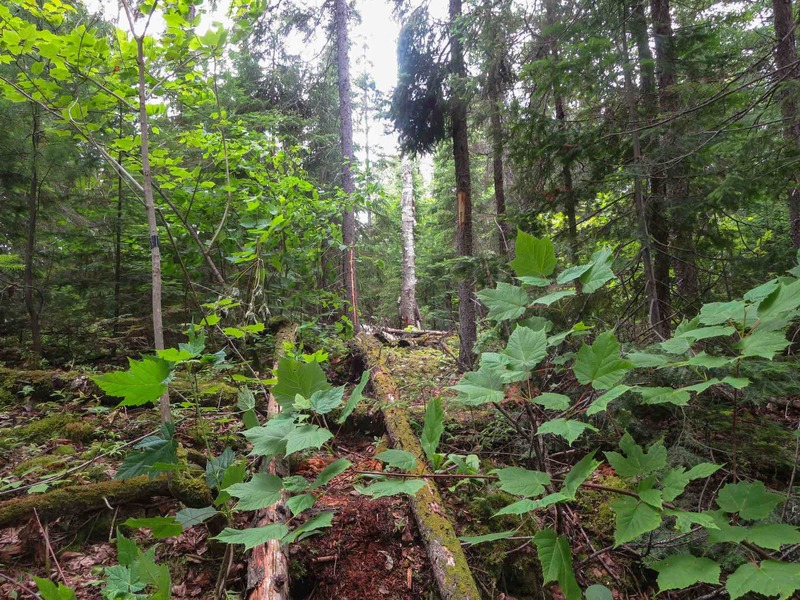 Of the “Mystery Portage” that we thought was the Napoleon we knew this – it was a hell of a trail , it would take us about an hour to do, and it would save us two hours of paddling down to the other portage and then back up. And that is how we decided to do again a trail we swore we would never set foot on again! 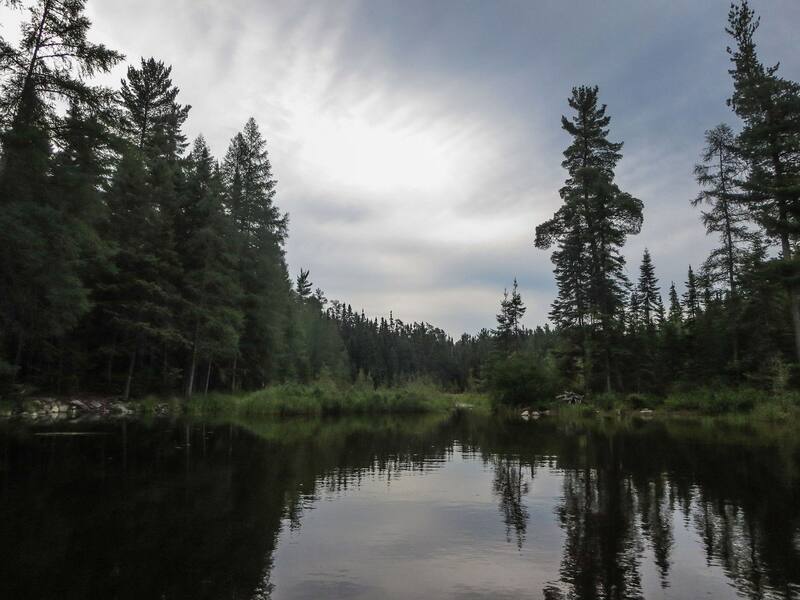 Except – as our Day One trip notes already made clear – we luckily ended up at the start of the actual Napoleon Portage trail and were spared both the additional paddling that the Pickerel Bay trail would have entailed and the bushwhacking of the “mystery trail”. We unloaded our canoe at 8:15 on the west side of the Napoleon and at 9 we were already paddling across Ferguson Bay to the beach on Sandy Inlet just up from Camp Wanapitei. We had pulled one big rabbit out of that hat! 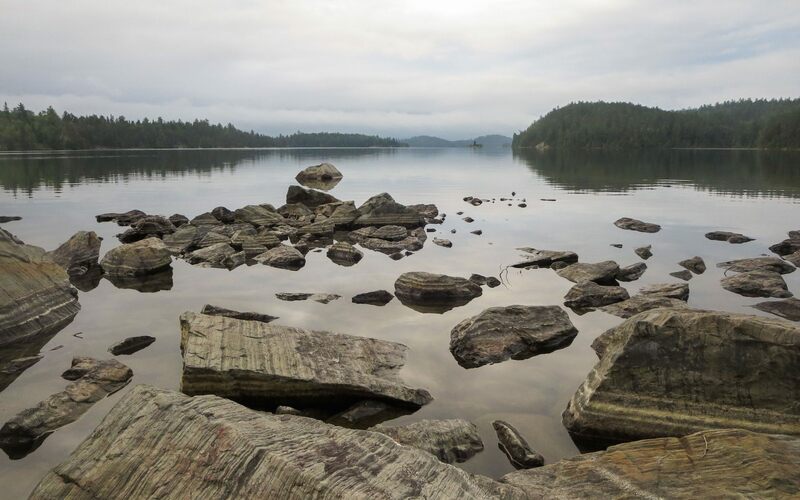 The best introduction to Temagami remains Hap Wilson’s book of the same name. It has seen a few editions and the sub-titles have changed with the times but it guides you through some choice Temagami canoe routes, giving you not only the information you need to deal with the lakes and rivers – portages, rapids, campsites – but also filling you in on the long and rich history of the area. 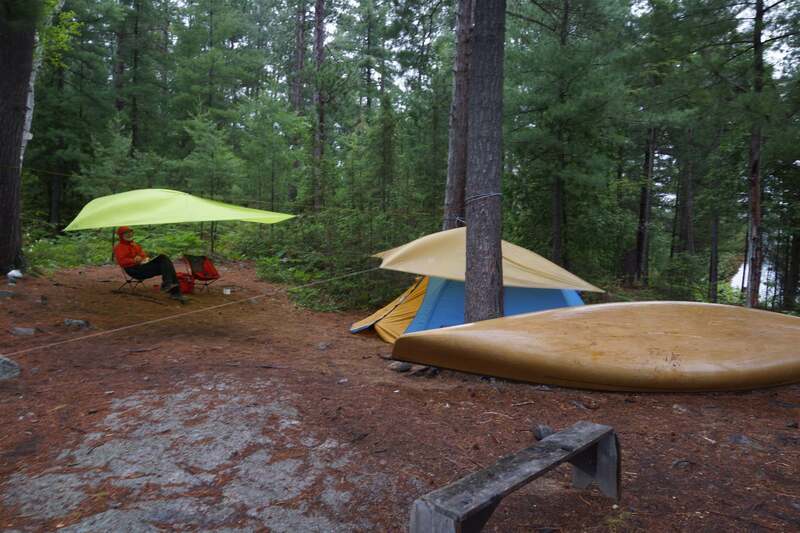 As well, there are tips on gear and camping and canoeing skills for those in need of a primer. The first edition, I think, came out in the late 1970’s and these days is considered a worthwhile investment as a collectible! 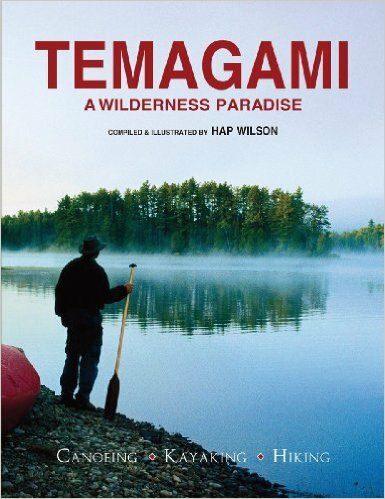 The copy of the edition I’ve got is titled Temagami: A Wilderness Paradise – Canoeing – Kayaking – Hiking and was published in 2011, a reprint of the 2004 edition. The government’s own no-frills folder-based canmatrix collection of maps is one source of the maps. Both the 1:50000 and the 1:250,000 and in either tif or pdf format. For the maps above go to the 041 folder using the appropriate letters and numbers to get the specific maps. Get started here. These days there is a much more user-friendly and visual approach to access the maps that Jeff McMurtrie has come up with. As with the maps above, they are available for free download. If you want, McMurtrie has the equipment to print the maps for you on plastic sheets. See his Jeffstopos website to get started. 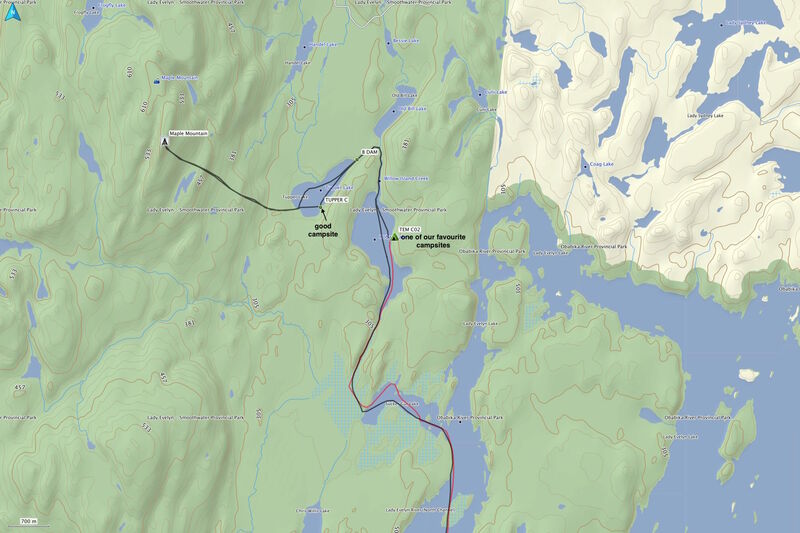 McMurtrie also has an annotated Temagami mapset available – a series of five maps covering the area. They will give you the portage and campsite information you need, as well as points of historical interest that you will paddle by. 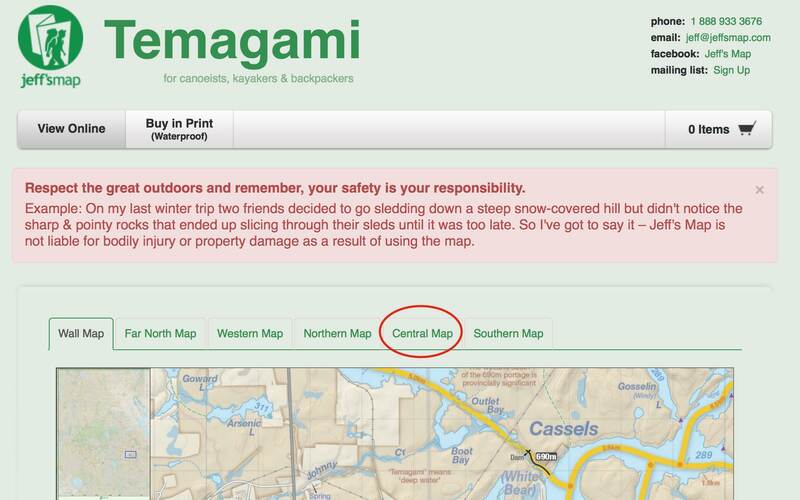 Check out the Jeff’s Temagami Map website here. You’ll want the Central one for this trip. Again, you can download the file and print it off yourself – all or just selected parts. Or copies are available either from Jeff directly or in select stores. 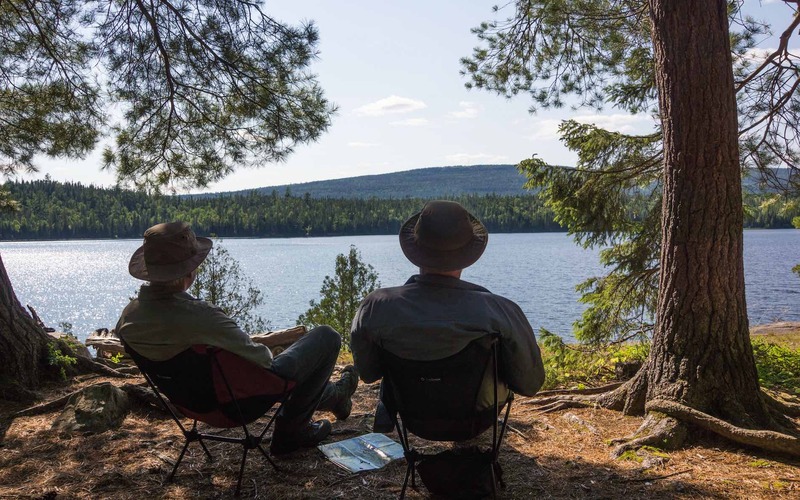 When we dropped in at the Temagami Outfitters store to buy a copy at the start of our trip, we were told that copies of Jeff’s maps were available – except for the sold-out Central map! Luckily we had downloaded digital copies the night before on our way to Temagami from the end of our Steel River trip. We ended up buying a copy of the map put out by the Friends of Temagami – a double-sided map with the Obabika Loop on one side and the Maple Mountain area on the other – which did the job nicely. Portage and campsite locations and other information is there. Like most maps these days, it is made of a waterproof and tear-resistant material. It is meant to go along with – and not replace – the 1:50000 topos mentioned above. 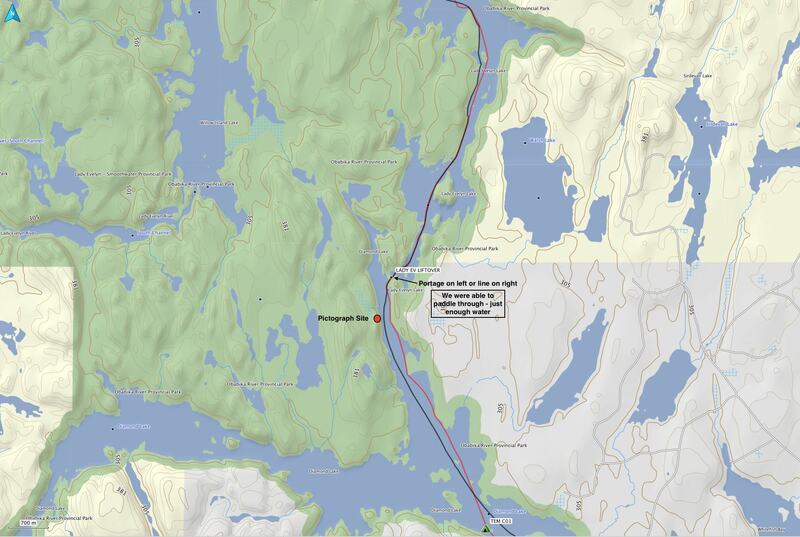 See here for the map details at the Friends of Temagami online store. 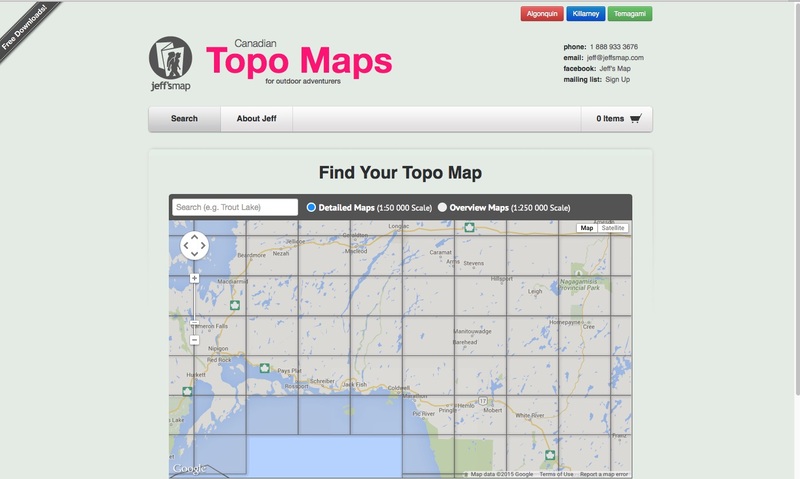 We both also have Garmin gps units with the Topo Canada maps v4.0 installed. While we like to navigate from the hardcopy maps in the map case, the gps units are appreciated in those inevitable instances when we’re just not 100% sure where we are! 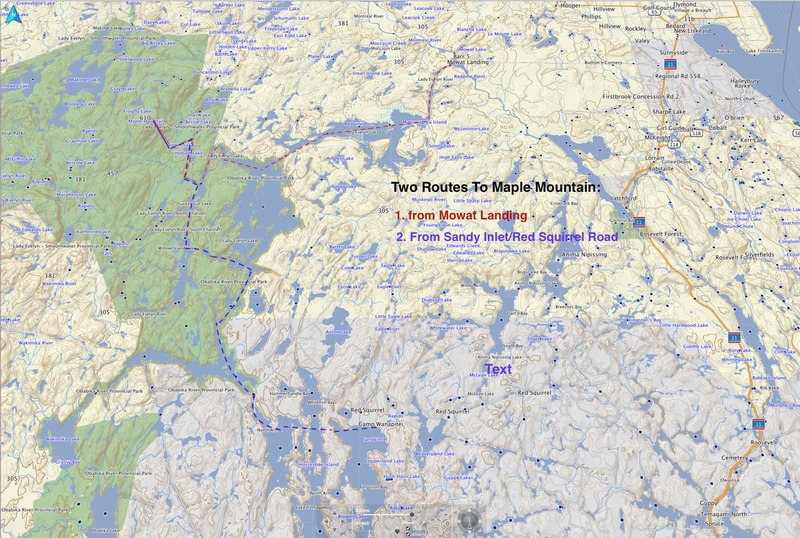 This entry was posted in wilderness canoe tripping and tagged canoeing to Maple Mountain, Diamond Lake pictograph site, Hobart Lake campsite, Lady Evelyn Lake flooding, Lady Evelyn Lift-Over, Maple Mountain fire tower, Maple Mountain hiking trail, Maple Mountain vertical rise, Mowat landing to Maple Mountain map, Temagami Napoleon Portage, Temagami's most popular route, Tupper Lake Maple Mountain. Bookmark the permalink. Really enjoyed your trip and photos. 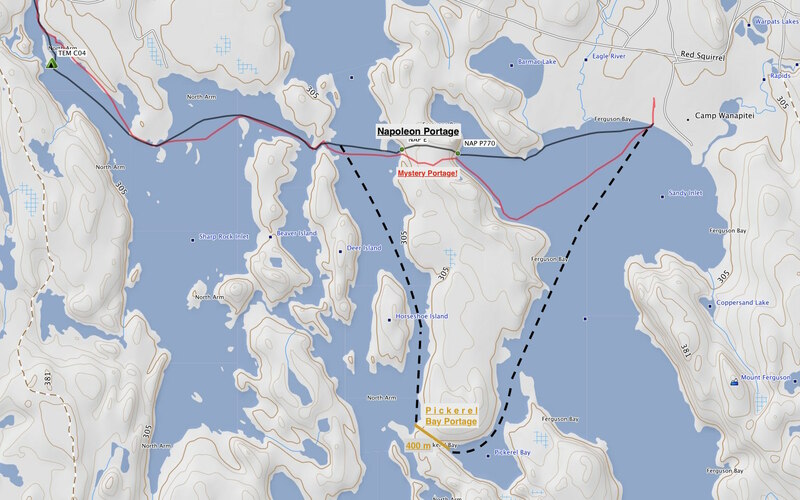 how long did the mystery portage take? I remember being on a well-marked portage that just disappeared as I went along. 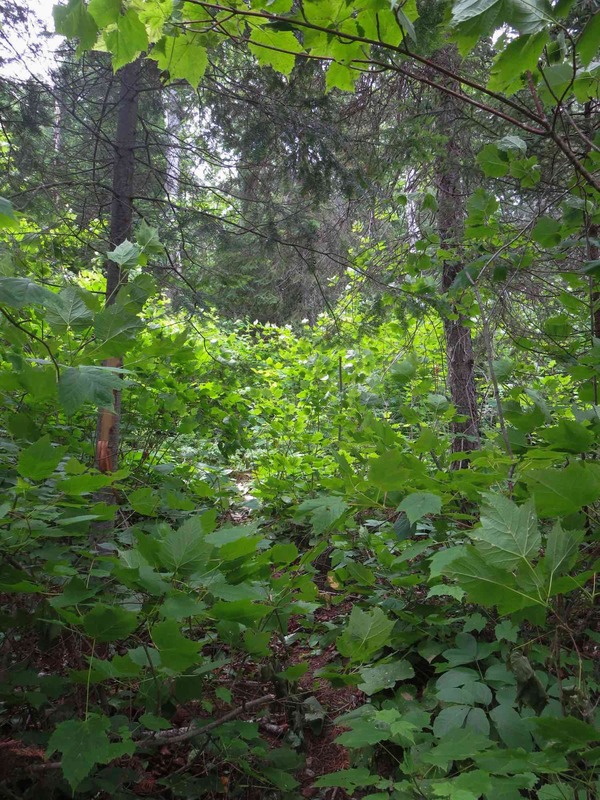 I ended up bushwacking along for about an hour until I noticed I was standing right in the middle of the trail. On the return trip the trail was so obvious I felt pretty foolish. 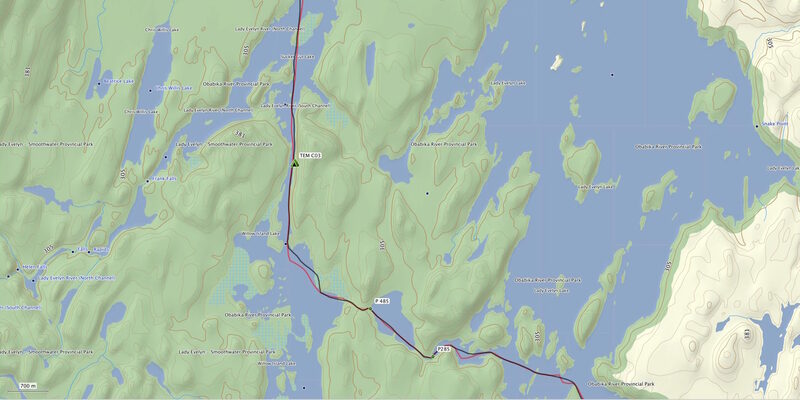 George, according to the gps track it took us a bit over an hour to do the 750-meter or so portage. It would have been a bit faster had we not bothered to put up some marking tape and trim some of the alders and young fir trees on what we thought was the “trail”! 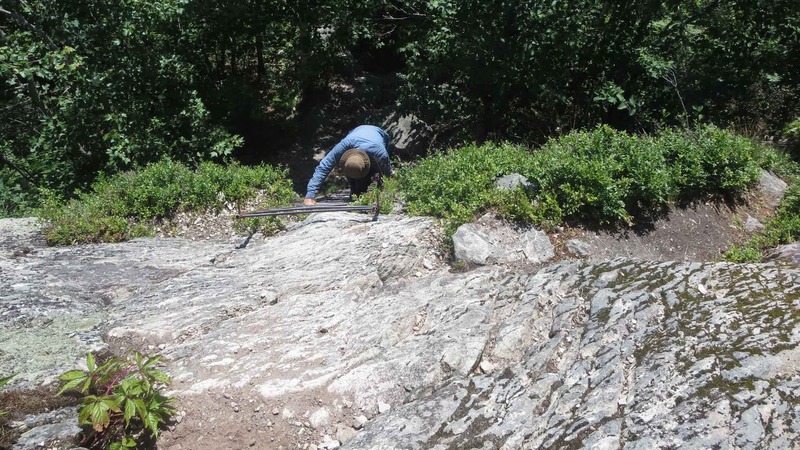 Herein lies the danger of having prospectors’ tape with you! 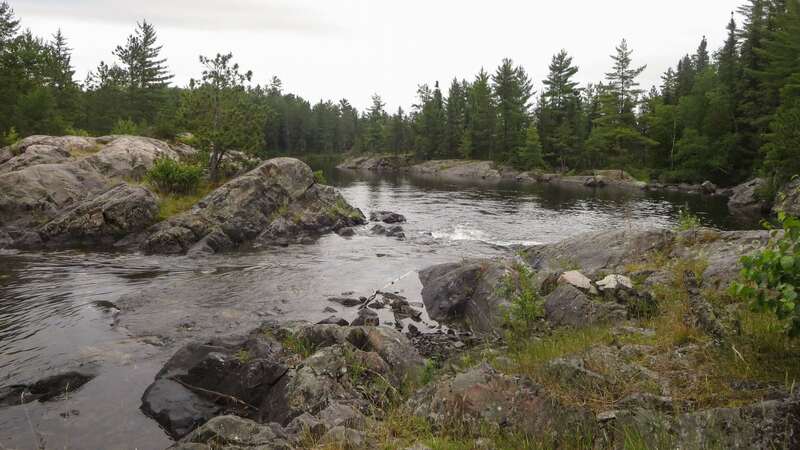 We had just spent a week on the Steel River system, the upper part of which has portage trails which have not been groomed in eight to ten years. This may partly explain why we just got sucked in to this “mystery trail”. It didn’t seem any worse. On our way back after our happy stumbling upon the actual Napoleon portage trail, we got it done in less than 45 minutes! Great read! This has been on my bucket list for some time and after reading your trip report I want to do it more than ever..
Ron, a good choice any time! 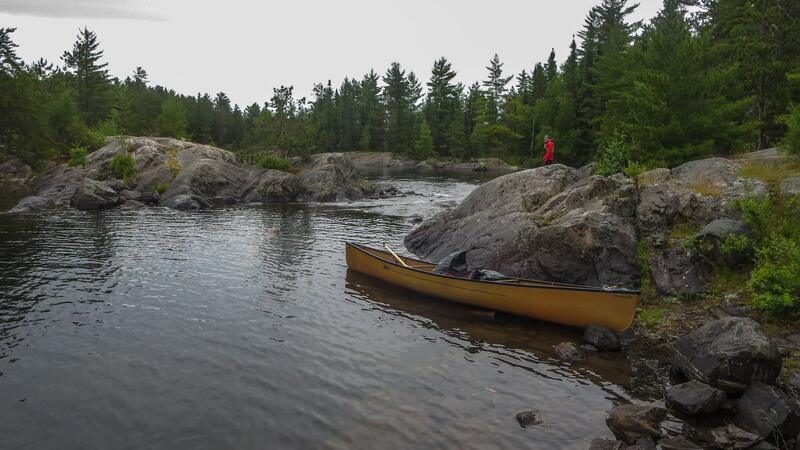 Some excellent campsites, varied scenery and water to paddle. We’ve done it three times. Next, we want to get back to Chee-skon and spend some quality time there – maybe a couple of days hiking the trails and just being there. We’re lucky to live so close to great places to go canoe tripping. Here’s to you checking it off that list at least once- and soon! Hello. 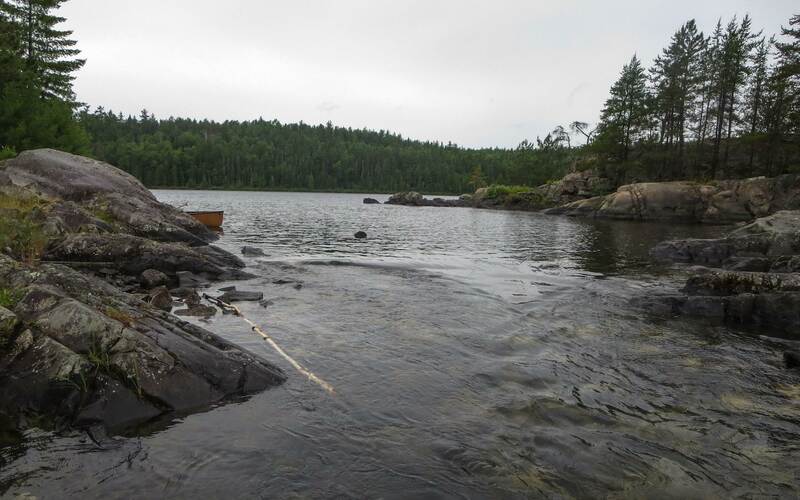 I am taking my first canoe trip in Ontario this August and am spending two weeks in the Temagami region. I’m planning on putting in and taking out at Sandy Inlet off of Red Squirrel Rd., but I’m a little wary of the logging roads. I’ve spent lots of time (and a few spare tires over the years) shuffling around the logging roads in northern Maine. Saying they’re rough is an understatement. They are often not marked and one can get lost quickly if you don’t know where you’re going. How would you describe the roads to Sandy Inlet? Is there signage along the road? Would you leave your truck there for two weeks? I’ve got a truck with 4×4, but that won’t help if I blow all my tires! David, the Red Squirrel Road is in pretty good shape and if you take it a bit slowly you will be fine. It is about 30 kilometers (19 miles) from the highway on Red Squirrel Road to the turn-off for Sandy Inlet. The Sandy Inlet side road is the one that is in worse shape but given your vehicle it should not be an issue. Re: parking: No guarantees but paddlers leave their vehicles there all the time. If you are really concerned, you might send an email to Camp Wanapetei and ask if you could park your vehicle on their property – $5. a day might do it. You could then put in on the camp shore. 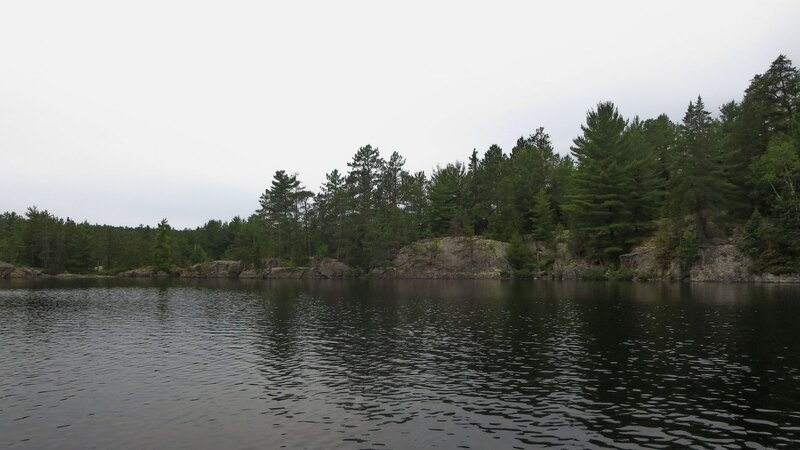 Enjoy your visit to Temagami. It is a great paddling destination.